Showing items in category Aden and Aden States, sorted by newest listed first. ADEN - 1941 'ACTIVE SERVICE' envelope addressed to UK. 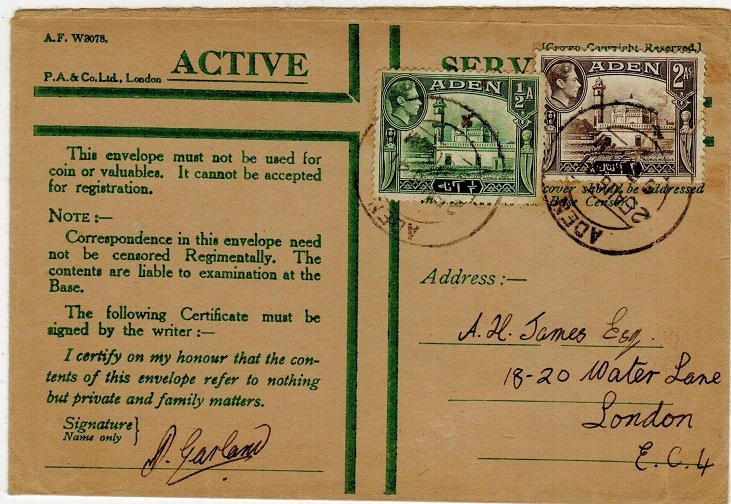 1941 (AUG.25) use of green on buff ACTIVE SERVICE envelope addressed to UK bearing 1/2a & 2a adhesives tied by ADEN cds. 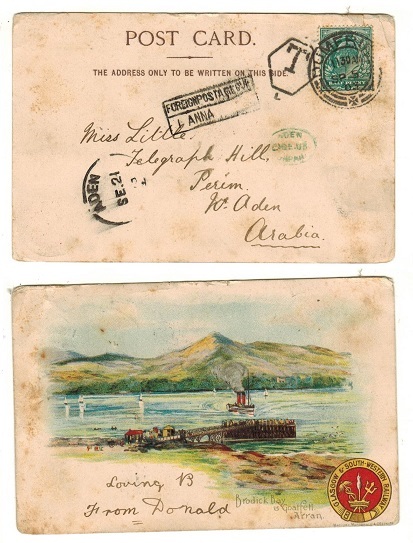 ADEN - 1903 inward postcard from UK with scarce 'ADEN/UNPAID' oval h/s applied in green. 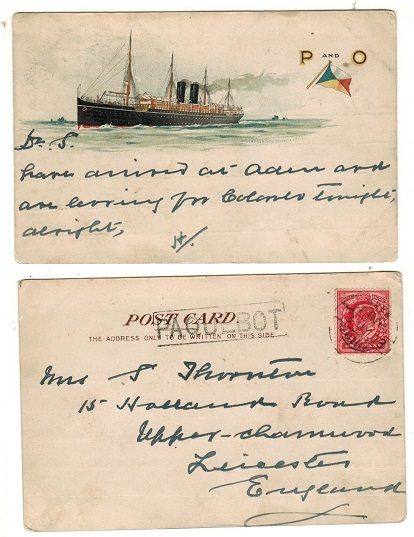 1903 inward picture postcard from UK addressed to Perim cancelled by ADEN arrival cds dated SE.21.03. 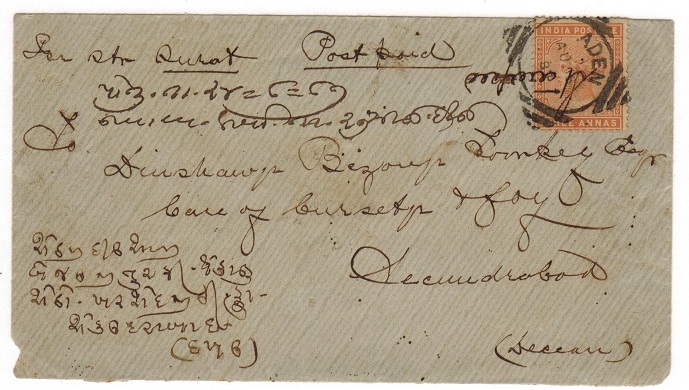 The card was under paid and has a scarce black boxed FOREIGN POSTAGE DUE/ 1 ANNA handstamp applied (Proud type UP19) and aqlso struck by rare green oval ADEN/ 21.SE.03/UNPAID handstamp. (Proud type UP11). A scarce due marking. 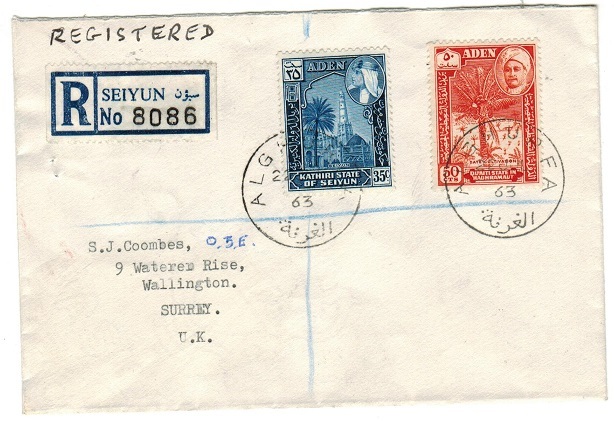 ADEN (States) - 1964 registered cover to UK used at AL HAUTAH. 1964 (MY.19.) 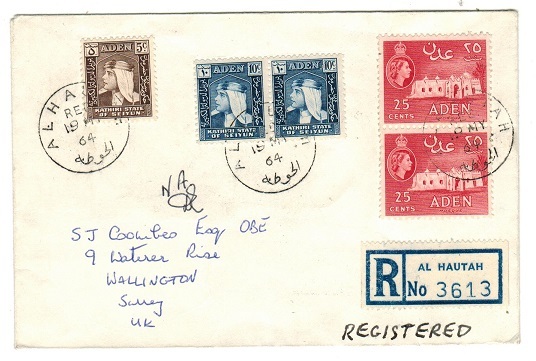 registered cover addressed to UK bearing Aden 25c pair tied in combination with 5c and 10c (x2) 'Kathiri State' adhesives by AL HAUTAH/REG cds's and with blue on white perforated R/AL HAUTAH/No. registered label at lower right. A scarce combination cover. 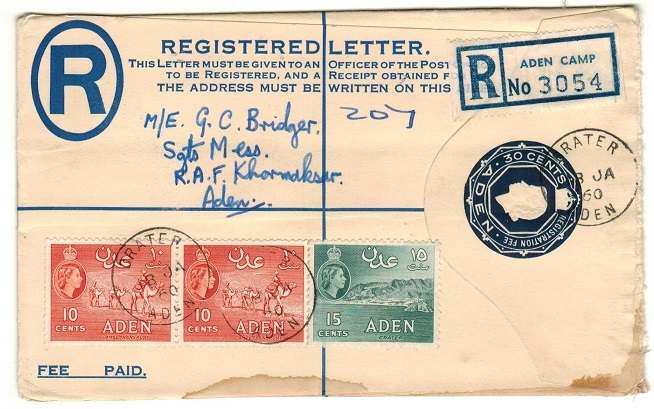 ADEN (States) - 1963 registered cover to UK used at ALGHURFA. 1963 (JUL.22.) registered cover to UK bearing 35c 'Kathiri State' tied in combination with 50c 'Qu'Aiti State' adhesive by s/r ALGHURFA cds's with blue on white perforated R/SEIYUN registered label at left. A scarce combination use. ADEN (States) - 1960 cover to UK used at QUSEI'AR struck in violet ink. 1960 (JU.26.) 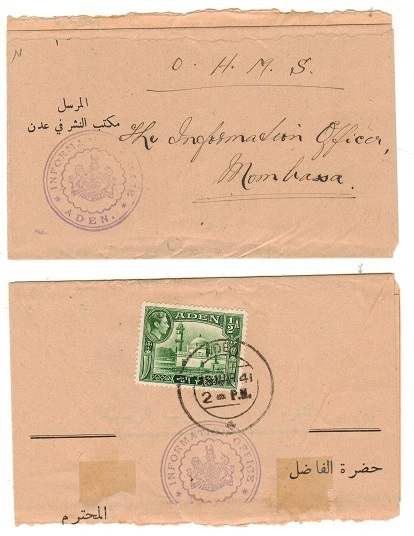 cover addressed to UK bearing Qu'aiti State 5c annd 15c pair tied by QUSEI'AR cds struck in violet ink. Proud type D1. 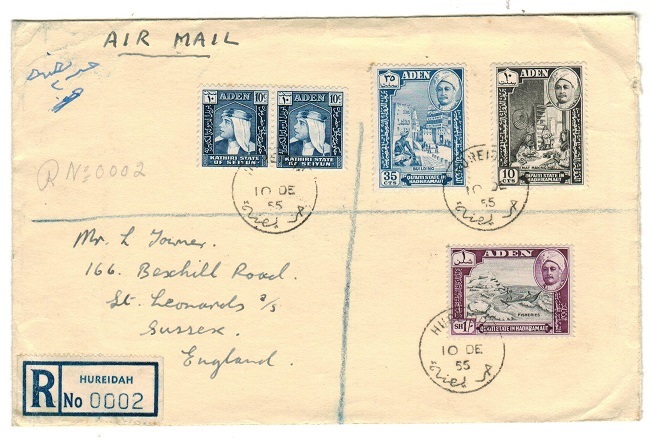 ADEN (States) - 1960 cover to UK used at HAMI. 1960 (JU.24.) 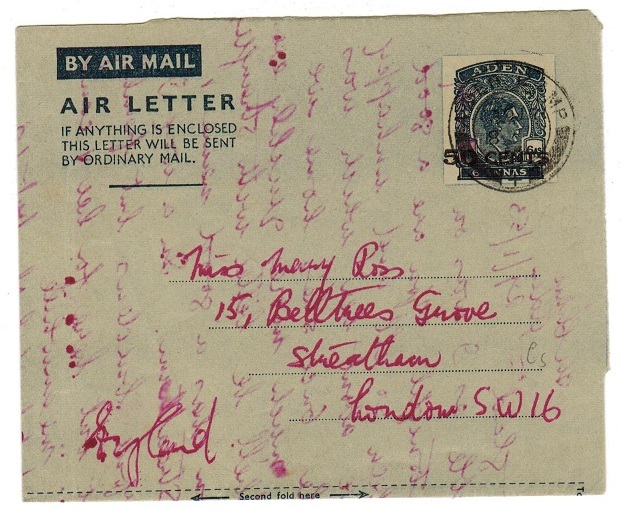 cover addressed to UK bearing Qu'aiti State 10c and 25c adhesives tied by HAMI cds struck in violet ink. Proud type D1. 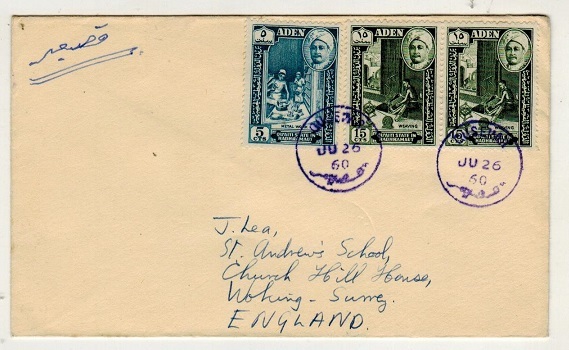 ADEN (States) - 1959 cover to UK used at HAURA. 1959 (JU.10.) 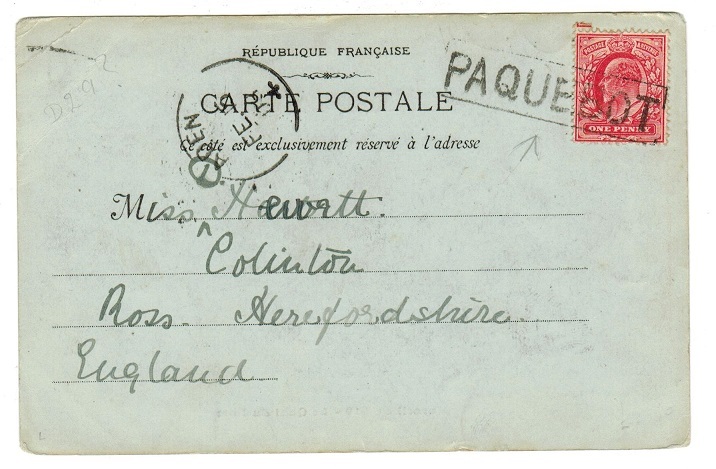 cover addressed to UK (central fold) bearing Qu'aiti State 10c and 15c adhesives tied by HAURA cds. Proud type D2. 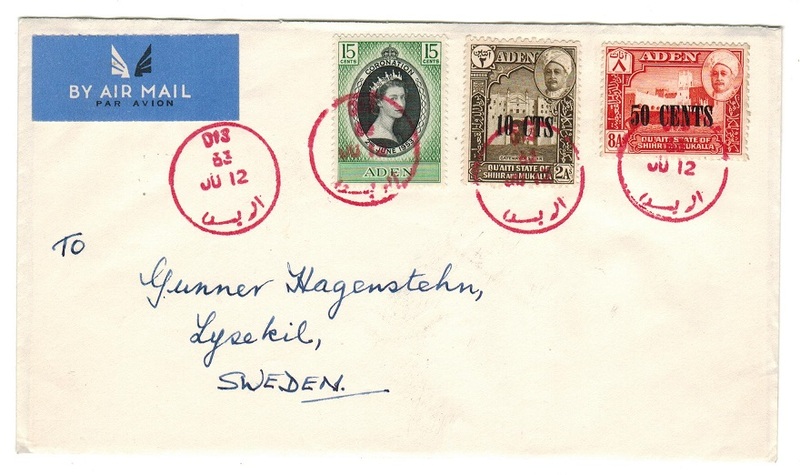 ADEN (States) - 1953 cover to Sweden used at DIS with cds in red ink. 1953 (JU.12.) 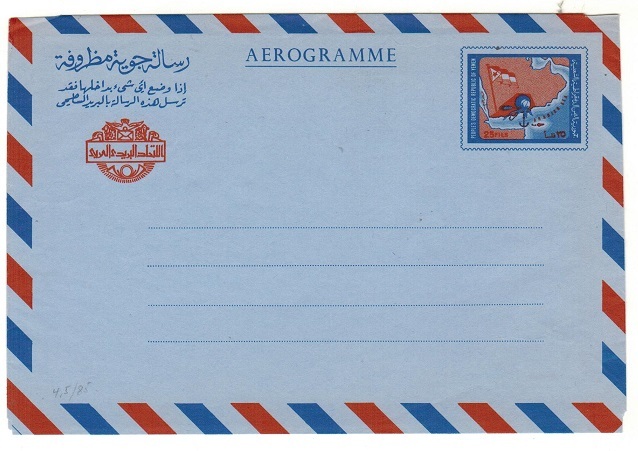 cover addressed to Sweden bearing QEII 25c 'Coronation' adhesive with 10c/2a and 50c/8a 'Qu'aiti State Of Shihr and Mukalla' adhesives by s/r DIS cds in red ink. Striking. 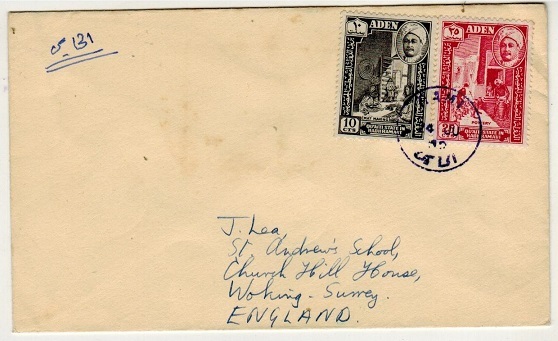 ADEN (States) - 1955 registered cover to UK used at HUREIDAH. 1955 (DE.10.) 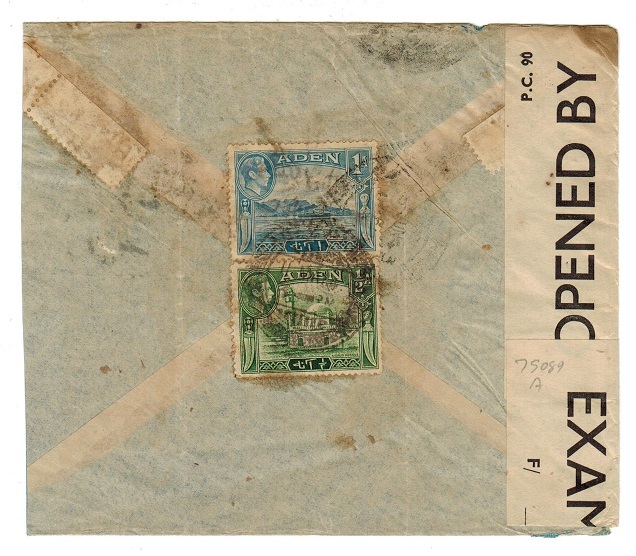 registered cover addressed to UK bearing 10c (x2) 'Kathiri State' adhesives tied in combination with 10c, 35c and 1/- 'Qu'Aiti' issues by HUREIDAH cds with blue on white perforated R/HUREIDAH/No. registered label at left. A scarce combination use. 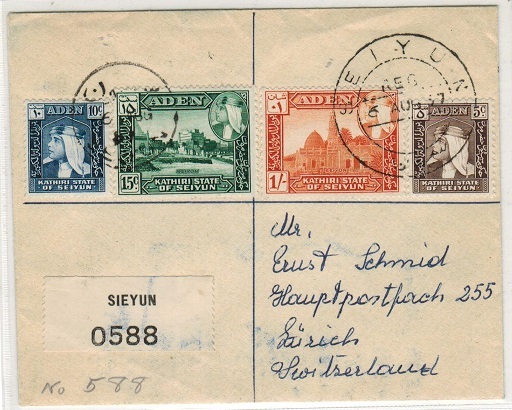 ADEN (States) - 1957 registered cover to Switzerland used at SIEYUN. 1957 (AUG.6.) 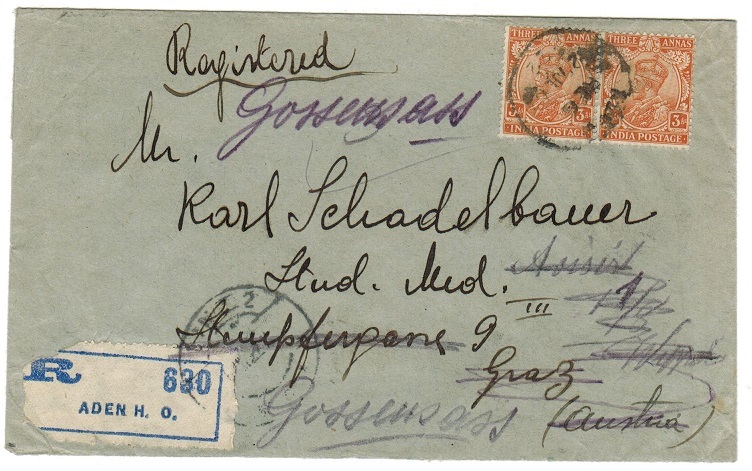 registered cover addressed to Switzerland bearing Kathiri 10c and 15c tied SEIYUN (Proud type D3) plus 5c and 1/- tied by SEIYUN/REG (Proud type R2) cds's and with scarce black on cream SIEYUN/0588 (note spelling) registered label at left. ADEN (States) - 1959 25c rate cover to UK used at AHMED BIN ZAIN. 1959 (AP.29.) 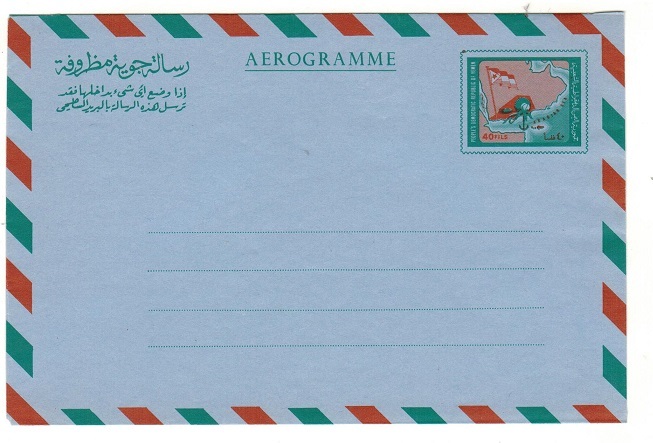 cover addressed to UK bearing Kathiri State 25c adhesive tied by HAUTAT AHMED BIN ZAIN cds. Proud type D2. 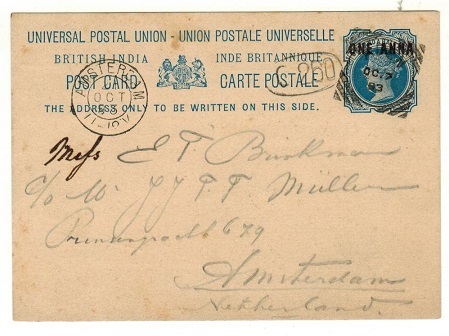 ADEN - 1893 use of Indian 1a on 1 1/2a blue PSC to Amsterdam. 1893 (OC.7.) 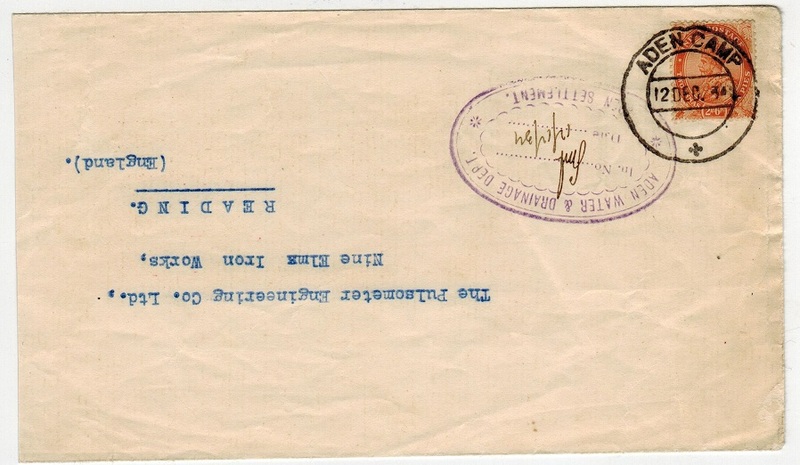 use of ONE ANNA on 1 1/2a blue on cream postal stationery postcard of India (H&G 9) addressed to Amsterdam and cancelled by squared circle ADEN cancel. ADEN - 1894 scarce use of Indian 1a on 1/2a blue PSC from Perim to Holland. H&G 9. 1894 (NO.23.) 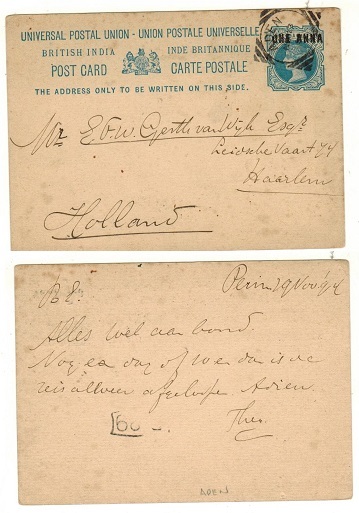 use of Indian 'ONE ANNA' on 1/2a blue postal stationery postcard (H&G 9) written at Perim and addressed to Holland. Cancelled by squared circle ADEN cds. Very scarce. ADEN - 1955 (circa) blue on cream 'FORMULA' RPSE (size G) unused. 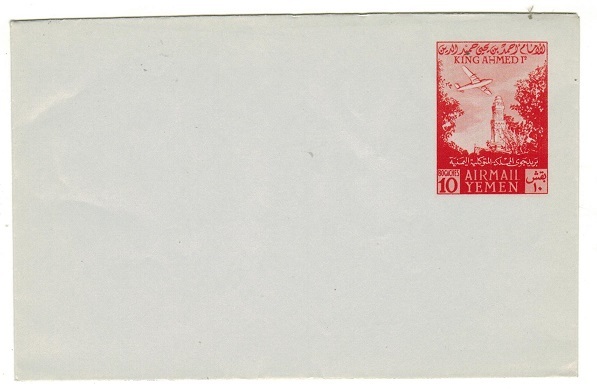 1955 (circa) blue on cream FORMULA registered postal stationery envelope (size G) in fine unused condition. ADEN - 1935 2a6p rate cover to UK struck by scarce SUPPORT JUBILEE FUND/ADEN handstamp. 1935 (MAY.1.) cover addressed to UK bearing Indian 2a6p orange adhesive tied by the scarce black boxed SUPPORT THE/JUBILEE FUND/ADEN handstamp. ADEN - 1951 50c on 6as indigo uprated postal stationery wrapper to Singapore. 1951 50c on 6as indigo postal stationery air letter with 20.5mm surcharge (un-listed by H&G) addressed to Singapore. 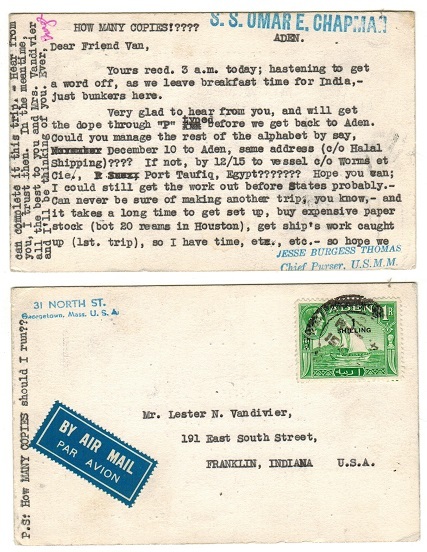 The air letter is overall toned but bears additional 15c on 2 1/2as adhesive tied ADEN and dated 12.MAR.52. Genuine use to unusual destination. Kessler 3. ADEN - 1903 1d rate illustrated 'P and O' postcard addressed to UK struck PAQUEBOT. 1903 (MY.3.) coloured 'P and O' illustrated picture postcard addressed to UK bearing 'GB' 1d adhesive tied ADEN with black boxed PAQUEBOT h/s alongside. ADEN - 1935 'GB' 1/2d stationery and 1d stamp duty 'cut outs' on local cover awaiting ship. 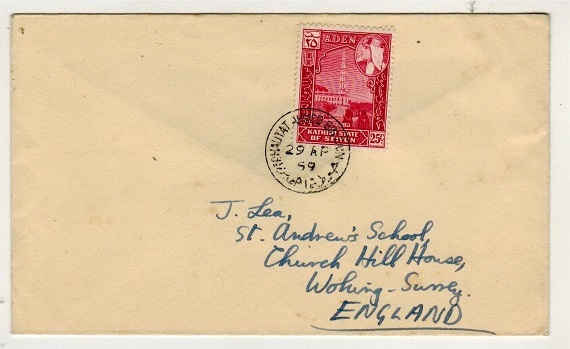 1935 cover address to the 'S.S.British Judge' and marked 'To await arrival' bearing 'GB' 1/2d green postal stationery 'cut out' alongside 'GB' 1d vermilion STAMP DUTY 'cut out' each tied by s/r ADEN cds and with PAQUEBOT/ADEN cds above. An unusual use of these stationery cut outs accepted for mail. ADEN - 1892 1d concessionary sailors cover to UK from 'H.M.S. Cossack'. 1892 1d sailors concessionary cover addressed to UK bearing GB 1d lilac adhesive tied by 'F.B./1125' (Foreign Branch) cancel. 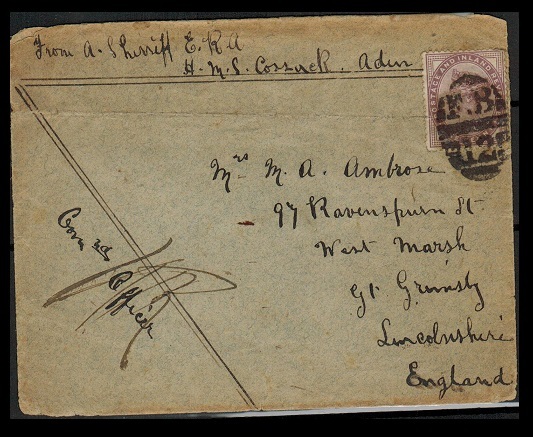 The cover has a horizontal fold through the stamp but is marked from a sailor on board 'H.M.S.Cossack at Aden' and is counter signed at lower left by the Commander. 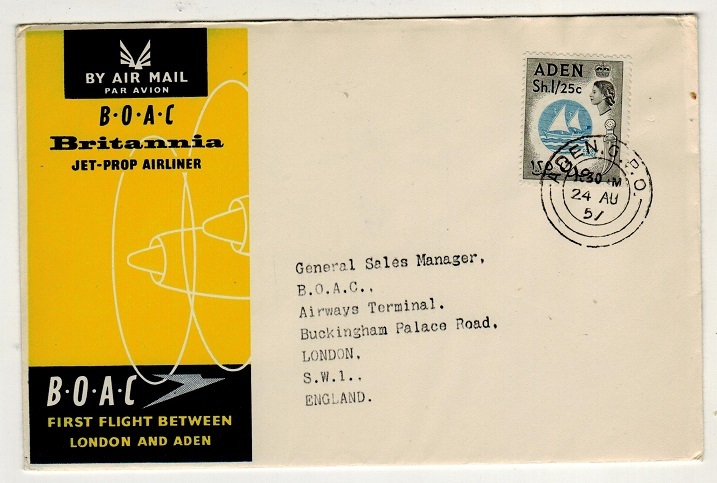 ADEN - 1957 first flight cover to UK. 1957 (AU.24.) use of illustrated 'B.O.A.C.' first flight cover to UK bearing 1sh/25c adhesive tied ADEN GPO. 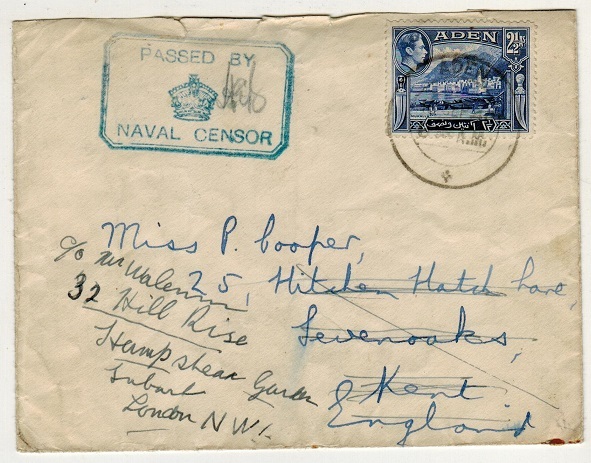 ADEN - 1940 2 1/2a rate 'PASSED BY NAVAL CENSOR' cover to UK. 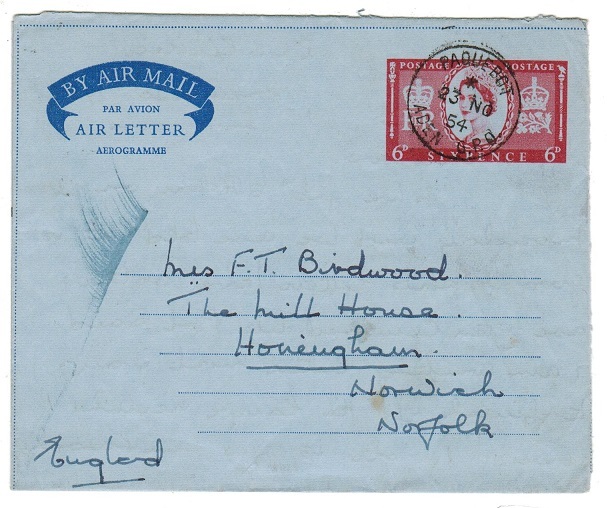 1940 cover addressed to UK then re-directed bearing 2 1/2a adhesive tied by ADEN cds with greenish crowned PASSED BY/NAVAL CENSOR h/s at left. 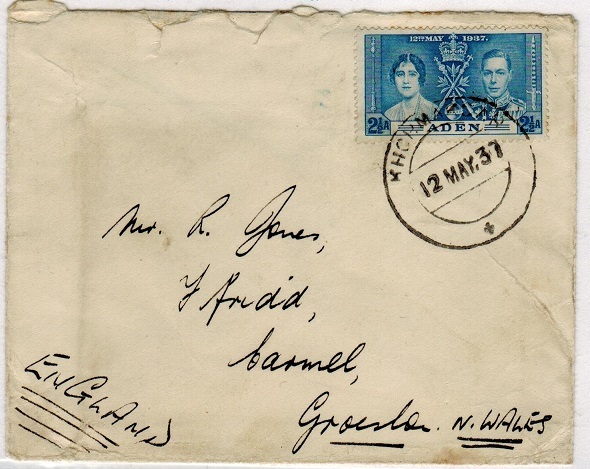 ADEN - 1945 'No.11 RAF/POSTAL HQ' stampless cover to UK. 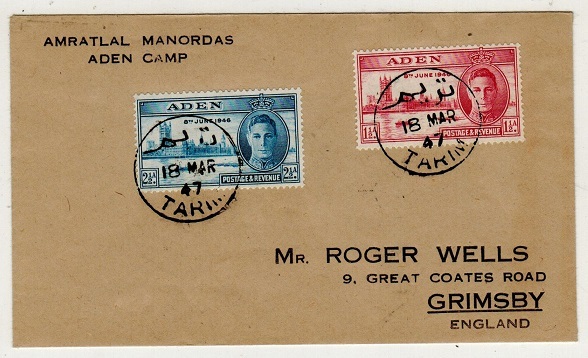 ADEN - 1947 'Victory' pair on cover to UK used at TARIM. 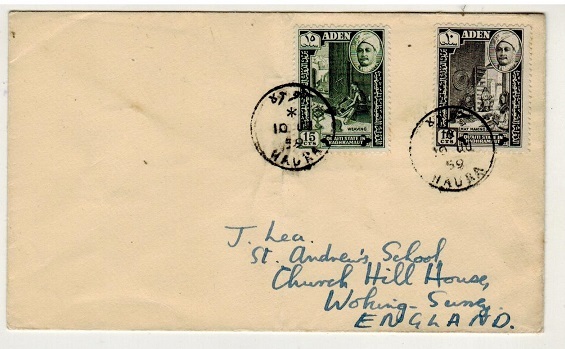 1947 (MAR.18) cover to UK bearing 1946 victory pair (SG 12+13) each tied by TARIM cds's. (Proud type D1). ADEN - 1953 15c brown PSE unused. H&G 5. 1953 15c Brown on cream unused postal stationery envelope. H&G 5. ADEN (States) - 1956 50cts orange and blue air letter overprinted 25fils/WINSTON CHURCHILL. QU'AITI STATE OF SHIHR AND MUKALLA- 1956 50cts orange and blue air letter of Qu'aiti State in Hadhramaut in unused condition revalued at 25fils and overprinted SOUTH ARABIA in green with blue WINSTON CHURCHILL overprint applied to commemorate his life in 1965. ADEN - 1968 (circa) blue on blue postal stationery air letter unused. 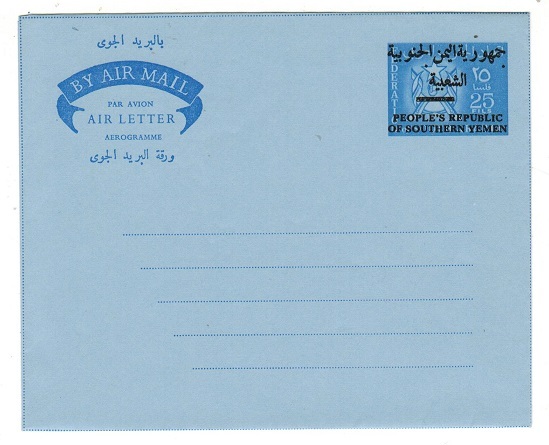 1968 (circa) blue on blue postal stationery air letter in unused condition overprinted in black PEOPLES REPUBLIC/OF SOUTHERN YEMEN. 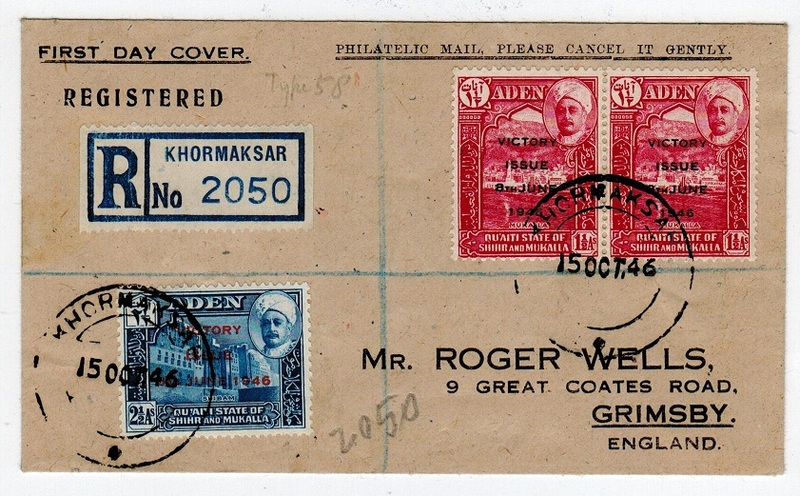 ADEN - 1937 'Coronation' trio on registered cover to UK used at KHORMAKSAR. 1937 (NOV.9.) registered cover to UK bearing the 'Coronation' trio tied by individual KHORMAKSAR cds's. A scarcer use from here. 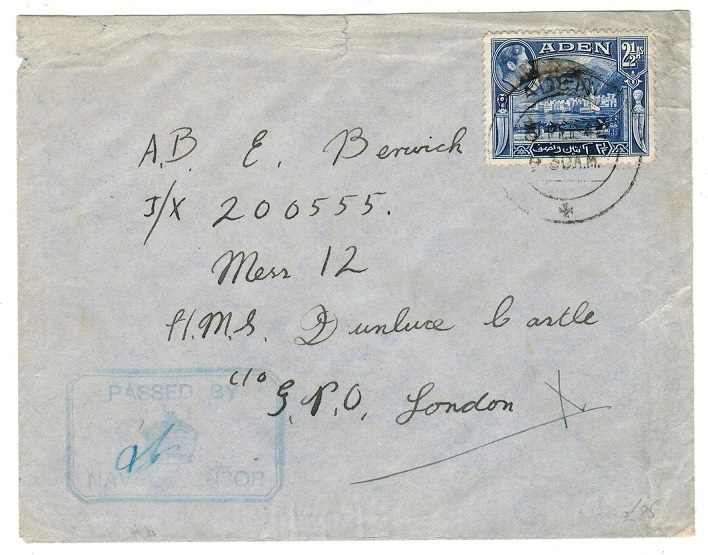 ADEN - 1935 registered cover to UK used at ADEN. 1936 (SEP.26.) 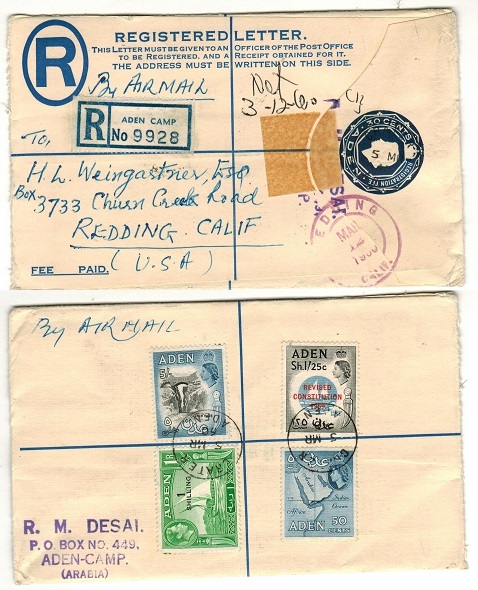 registered cover addressed to UK bearing Indian 2a6p in blue and another in orange plus 3a adhesive tied by ADEN/REG d/r cds. Ex Hart. ADEN - 1936 2a6p rate cover to UK used at ADEN CAMP. 1936 (DEC.12.) 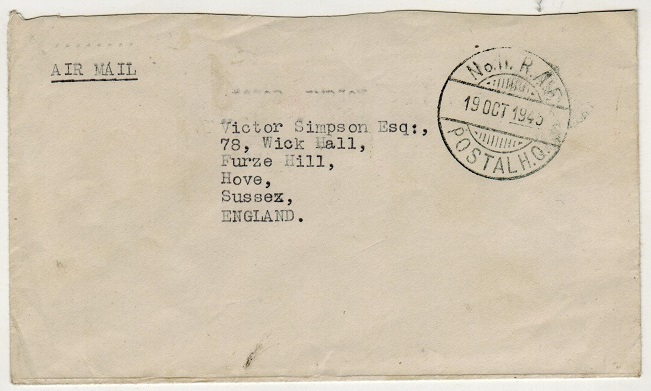 cover addressed to UK bearing Indian 2a6p orange adhesive tied by ADEN CAMP cds with divit in top ring (Proud type D21) variation. Violet oval ADEN WATER & DRAINAGE DEPT/ADEN SETTLEMENT cachet alongside. Ex Hart. 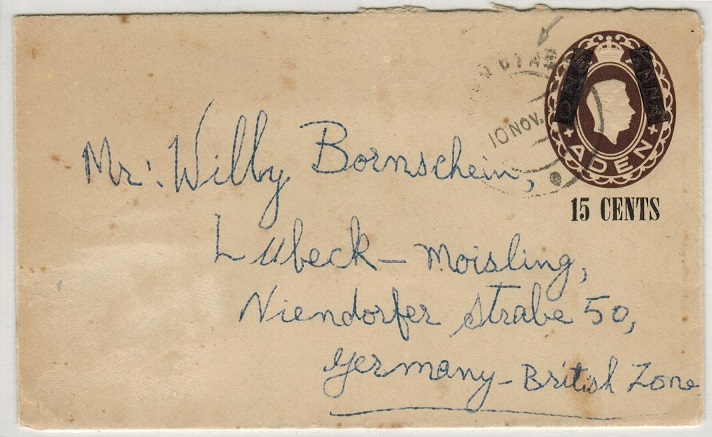 ADEN - 1922 6a rate registered cover to Austria. 1922 (JUL.27.) 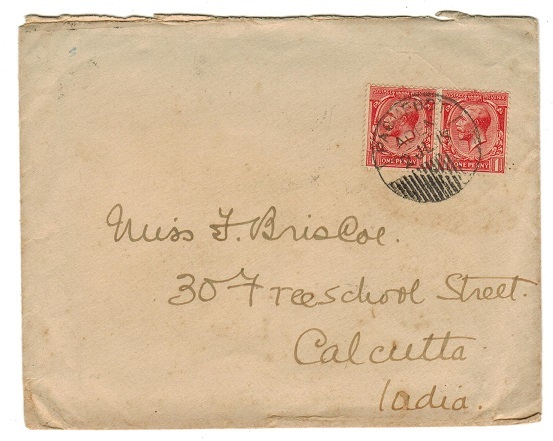 registered cover addressed to Austria bearing Indian 3a orange pair tied by s/r ADEN/REG cds. Blue on white R630/ADEN H.O. registered label at lower left indicating the origin from the Harbour Office located at the Prince of Wales Pier. Ex Hart. ADEN - 1940 2a rate 'PASSED BY CENSOR/11' censor cover to India. 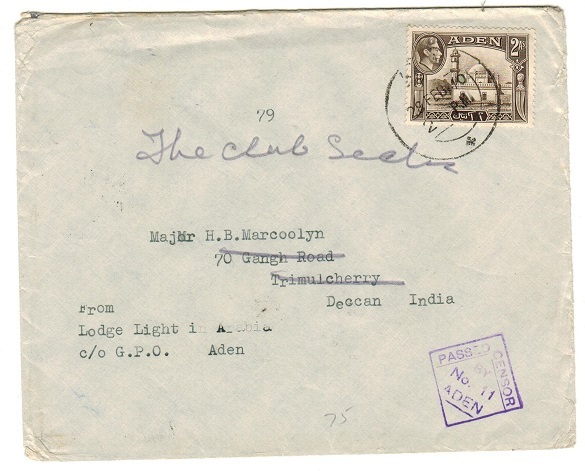 1940 (FEB.28) cover addressed to India bearing 2a tied ADEN with violet diamond (type 1) PASSED CENSOR/BY/No.11/ADEN h/s. ADEN - 1941 O.H.M.S. 'Information Office' 1/2a rate wrapper addressed to Mombasa. 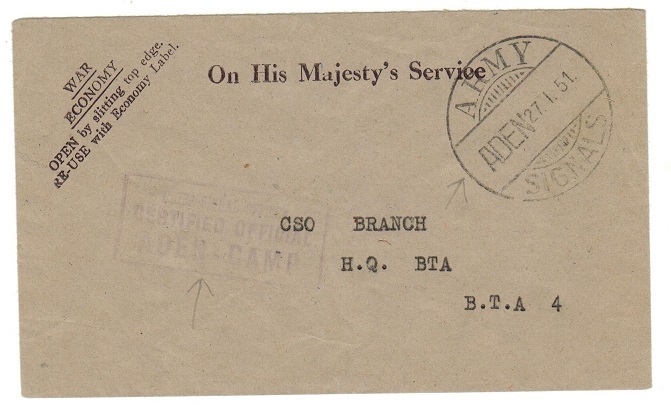 1941 (MAR.18) local wrapper to Mombasa & marked 'O.H.M.S' with 1/2a adhesive tied to reverse by ADEN cds & with violet crested INFORMATION OFFICE/ADEN cachet applied. ADEN - 1951 1/- on 1r green 'S.S.OMARE E CHAPMEN' maritime use of postcard to USA. 1951 use of blank type postcard addressed to USA bearing 1 SHILLING on 1r green adhesive tied ADEN and struck on reverse 'S.S.OMARE E CHAPMEN'. A nice maritime use. 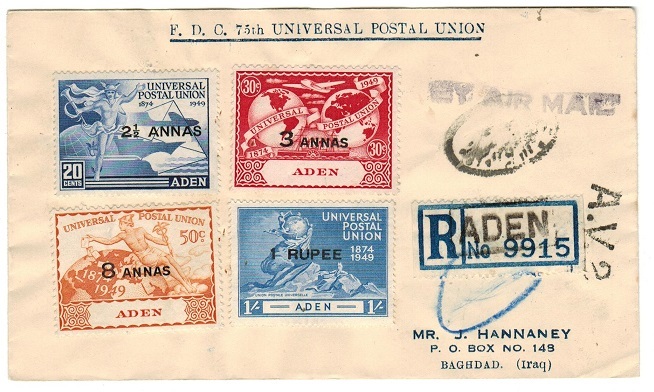 ADEN - 1949 'UPU' set on registered FDC to Iraq with 'A.V.2.' transmission h/s. 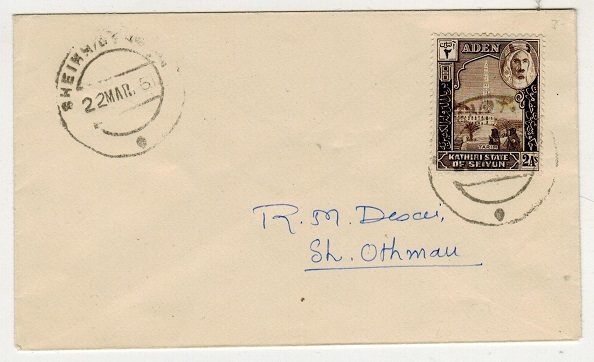 1949 pre-printed 'FDC-75th Universal Postal Union' cover addressed to Iraq with Qu'aiti State in Hadhramaut UPU set of four (SG 16-19) attached (uncancelled) and with blue on white perforated 'blank' type R/N0.9915 registered label at right handstamped by boxed ADEN strike and with scarcer 'A.V.2.' transmission strike. Iraq arrival b/s's. 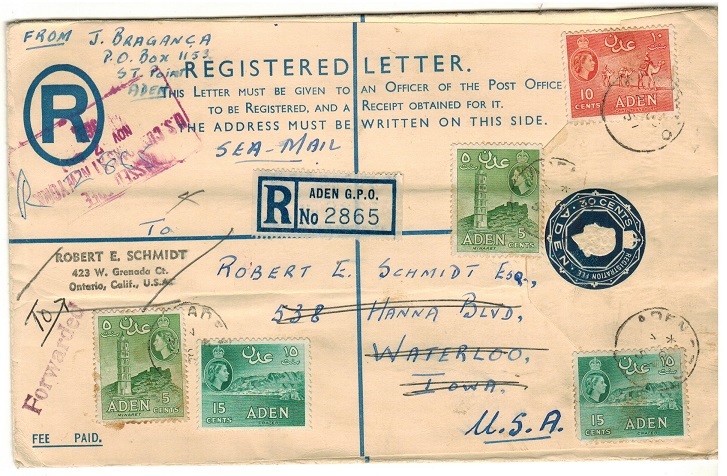 ADEN - 1946 registered cover to UK used at KHORMAKSAR. 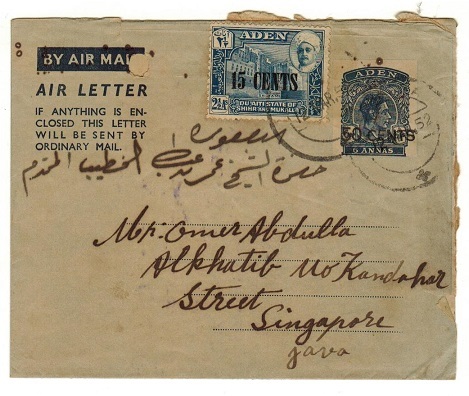 QU'AITI STATE OF SHIHR AND MUKALLA - 1946 (OCT.15) registered cover addressed to UK bearing 1946 Victory pair (SG 12+13) plus additional 1 1/2a tied by KHORMAKSAR cds's. (Proud type D5). 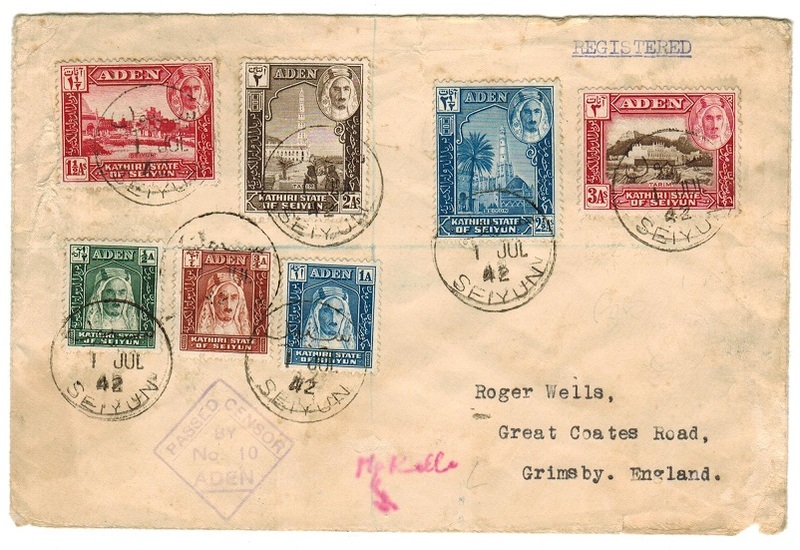 ADEN (States) - 1947 registered cover to UK used at SHIBAM. 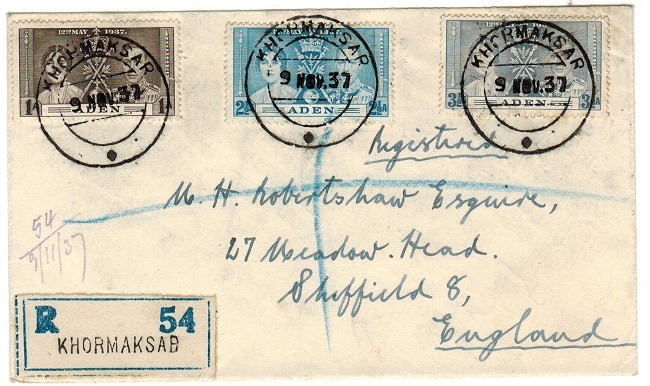 KATHIRI STATE OF SEIYUN - 1947 (16.MAR) cover to UK bearing 1946 Victory pair (SG 12+13) tied by SHIBAM cds's. (Proud type D1). 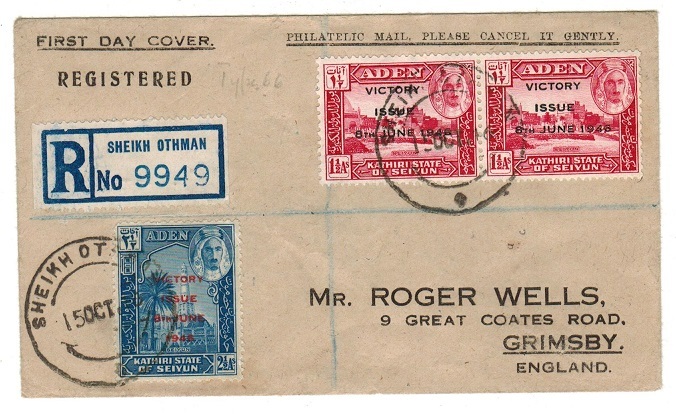 ADEN (States) - 1947 registered cover to UK used at SHEIK OTHMAN. KATHIRI STATE OF SEIYUN - 1947 (OC.15) registered cover to UK bearing 1946 Victory (SG 12+13) plus additional 1 1/2a tied by two strikes of the SHEIKH OTHMAN cds. (Proud type D7). 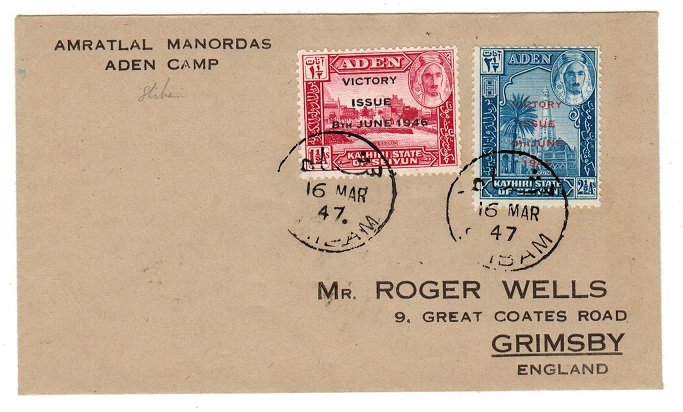 ADEN (States) - 1947 registered cover to UK used at KAMARAN. KATHIRI STATE OF SEIYUN - 1947 (OC.21) registered cover to UK bearing 1946 Victory pair (SG 12+13) plus additional 1 1/2a tied by KAMARAN cds's. (Proud type D2). 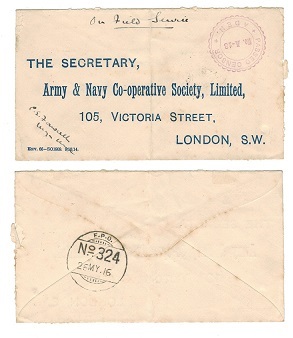 ADEN - 1884 1/4a reply section of the Indian PSRC to Bombay used at ADEN. H&G 3. 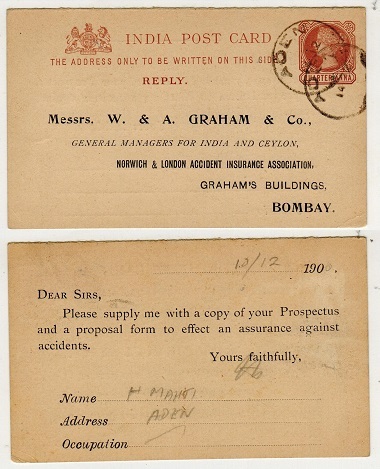 1884 reply section of the Indian 1/4a+1/4a postal stationery reply postcard (H&G 3) addressed to Bombay with pre-printed message on reverse regarding prospectus and cancelled by s/r ADEN cds dated 14.1200. 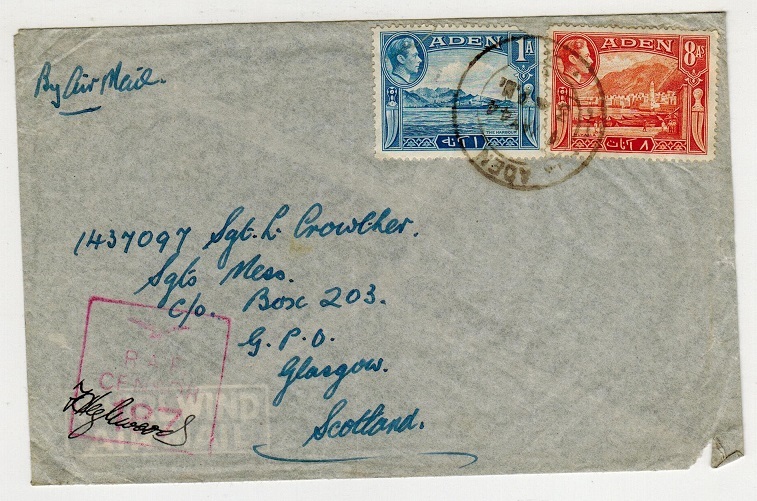 ADEN - 1939 'GB' 1 1/2d on cover to UK tied PAQUEBOT/ADEN. 1939 (OCT.9.) cover addressed to UK bearing GB 1 1/2d adhesive tied by PAQUEBOT/ADEN cds. ADEN - 1939 9p green PSC cto'd uprated use at KHOHMAKSAR. H&G 1. 1937 9 pies green on dark buff postal stationery postcard bearing 'Dhow' 1/2a and 1a adhesives on reverse side (SG 1+3) tied by scarce d/r KHOHMAKSAR cds dated 1.APR.37 on the first day of issue. Cancelled by favour without address or message but a rare use from this office. H&G 1. ADEN (States) - 1951 2a rate local cover used at SHEIKH OTHMAN. 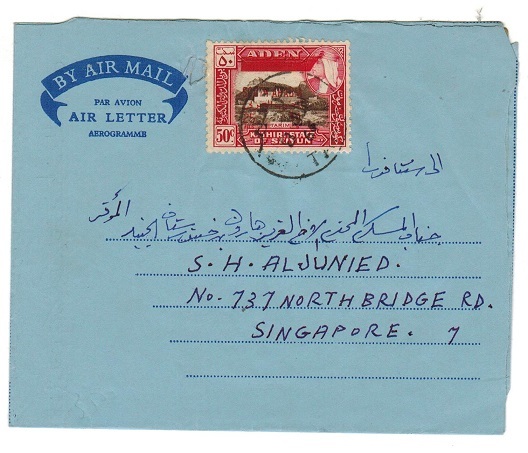 1951 (MAR.22) locally addressed cover bearing 2as Kathiri adhesive (SG 5) tied by light SHEIKH OTHMAN cds with stronger strike alongside. ADEN - 1950 2 1/2a rate cover to UK used at MAALLA. 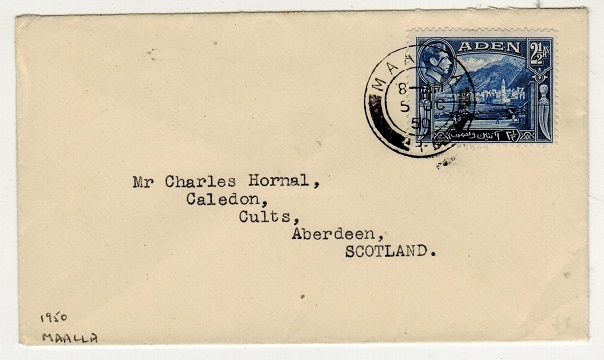 1950 (OC.5) cover to UK bearing 2 1/2as (SG 21) tied by MAALLA cds. Proud type D6. 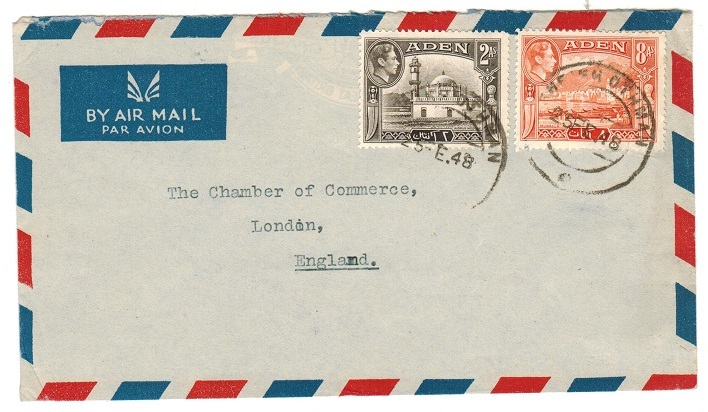 ADEN - 1953 30c dark blue RPSE uprated to USA and used at ADEN GPO. H&G 3a. 1953 30c dark blue on cream registered postal stationery envelope (size H) addressed to USA and bearing additional 5c (x2), 10c and 15c (x2) adhesives tied ADEN GPO and dated OC.3.57. H&G 3a. 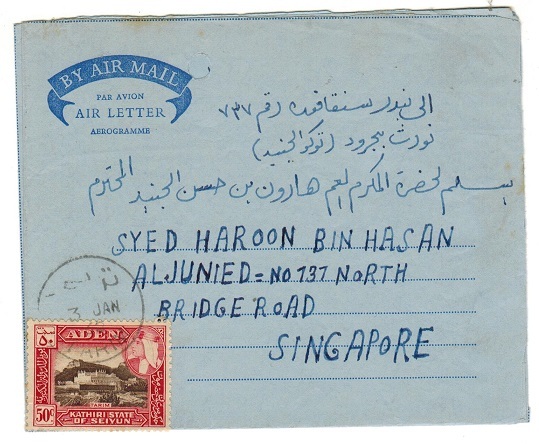 ADEN (States) - 1966 FORMULA air letter use to Singapore from TARIN. 1966 (JU.8.) use of dark blue on blue FORMULA postal stationery air letter addressed to Singapore bearing Kathiri State 50c adhesive tied TARIN. 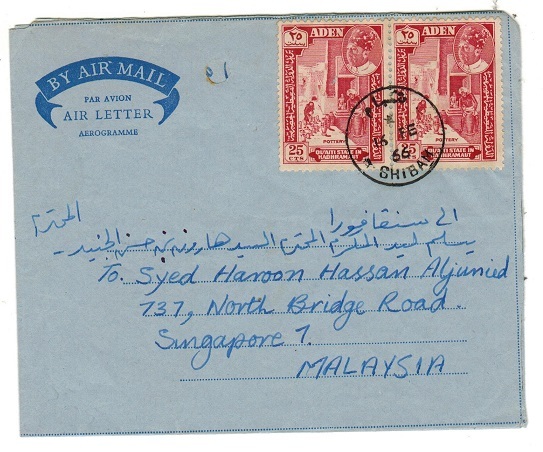 ADEN (States) - 1962 FORMULA air letter use to Singapore from TARIN. 1962 (JAN.3.) use of dark blue on blue FORMULA postal stationery air letter addressed to Singapore bearing Kathiri State 50c adhesive tied TARIN. 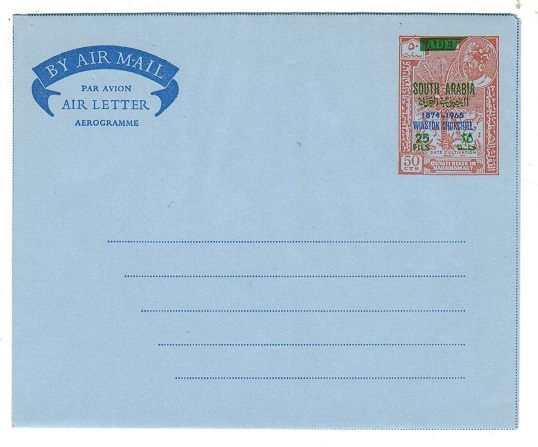 ADEN (States) - 1966 FORMULA air letter use to Singapore from SHIBAN. 1966 (FE.16) use of dark blue on blue FORMULA postal stationery air letter addressed to Singapore bearing Qu'aiti State 25c adhesive pair tied SHIBAN. ADEN - 1953 30c dark blue RPSE used locally at CRATER. H&G 3. 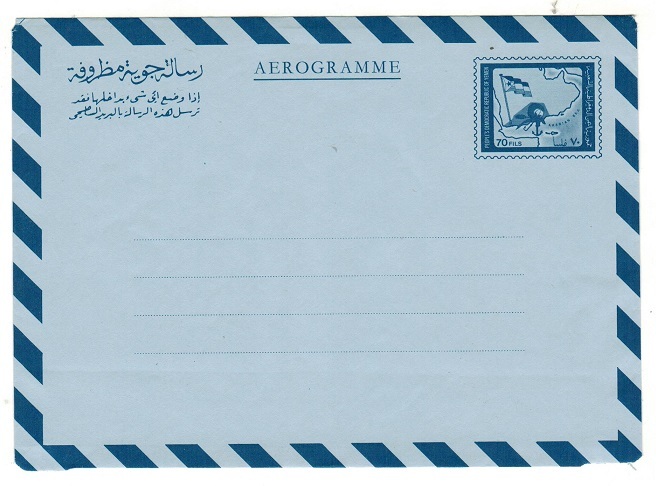 1953 30c dark blue on cream registered postal stationery envelope (size G) addressed locally to 'RAF Khormaksar' bearing 10c (x2) and 15c adhesives cancelled by CRATER/ADEN dated 18.JA.60. H&G 3. ADEN - 1953 30c dark blue RPSE to USA used at CRATER. H&G 3. 1953 30c dark blue on cream registered postal stationery envelope (size G) addressed to UK with additional 50c and 5/- adhesives on reverse side along with 1/- on R1 and 1/25c 'Revised Consitution' adhesive all tied by CRATER/ADEN cds's dated 5.MR.60. 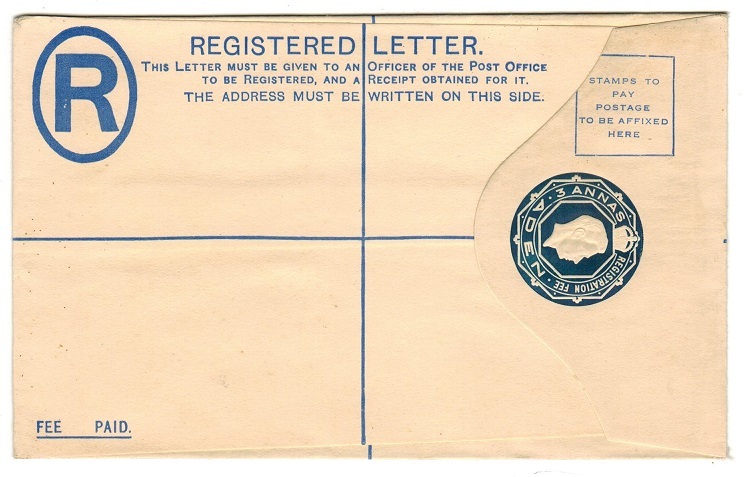 A scarcer mixed franking. H&G 3. 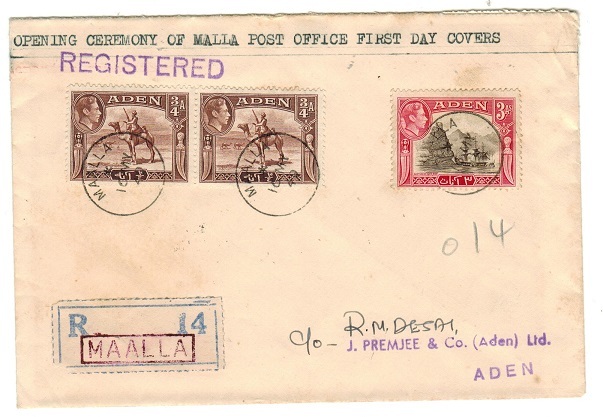 ADEN - 1949 registered local cover used at MAALLA. 1949 (MY.16.) registered cover addressed locally marked 'First Day Cover' and bearing 3/4a (x2) and 3a adhesives tied by s/r MAALLA cds with blue on cream 'blank' type registered label handstamped by boxed MAALLA handstamp struck in red. (Proud type R2). ADEN - 1948 10a rate cover to UK used at SHEIKH OTHMAN. 1948 (FE.25.) cover addressed to UK bearing 2a and 8a adhesives tied by d/r SHEIKH OTHMAN cds. (Proud type D7). 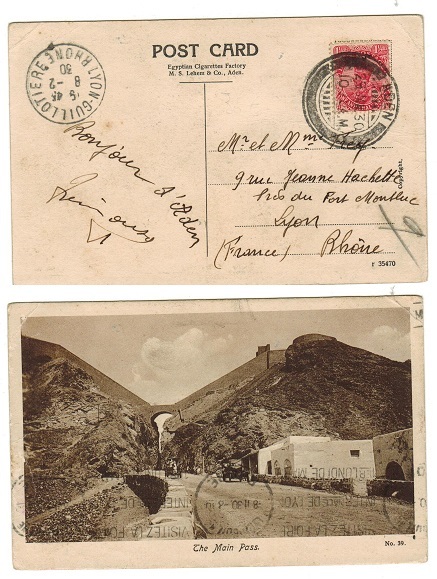 ADEN - 1930 1 1/2d rate postcard use to France. 1930 (JA.29.) use of picture postcard addressed to France depicting 'The Main Pass' bearing Indian 1 1/2as red adhesive tied by ADEN cds. 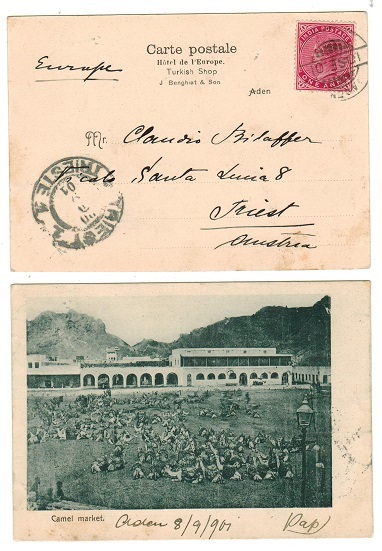 ADEN - 1901 use of picture postcard to Austria. 1901 (SE.10.) use of picture postcard addressed to Austria depicting 'Camel Market' and bearing Indian 1a adhesive tied ADEN. 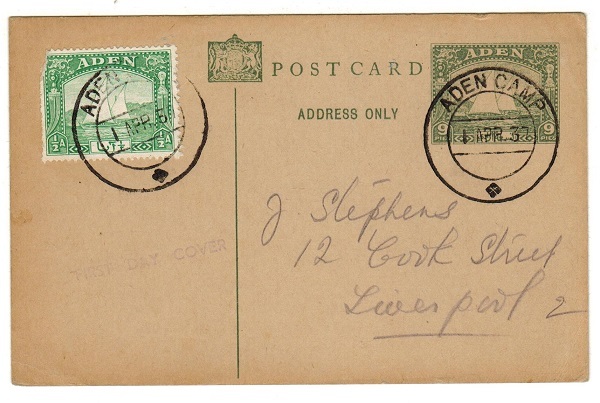 ADEN - 1937 9p green 'Dhow' uprated PSC to UK used at ADEN CAMP. H&G 1. 1937 9 pies green on dark buff postal stationery postcard bearing additional 'Dhow' 1/2a adhesive tied by ADEN CAMP cds's. 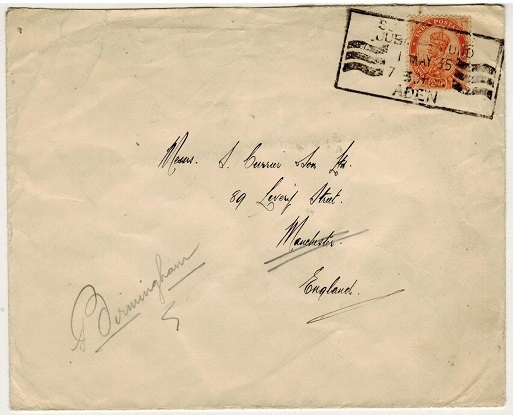 The card has no message and was sent on the first day of issue to UK as a commemorative item on April 1st 1937. Handstamped FIRST DAY COVER in violet. A difficult card. H&G 1. ADEN - 1900 2a rate postcard use to Austria. 1900 (AU.4.) 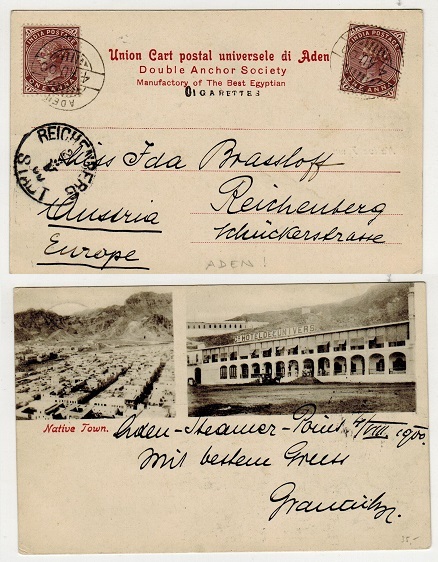 use of picture postcard addressed to Austria depicting 'Native Town' and bearing two examples of the QV 1a plum adhesive each cancelled by ADEN cds. ADEN - 1944 'RAF/CENSOR/187 cover to UK. 1944 (MY.4.) 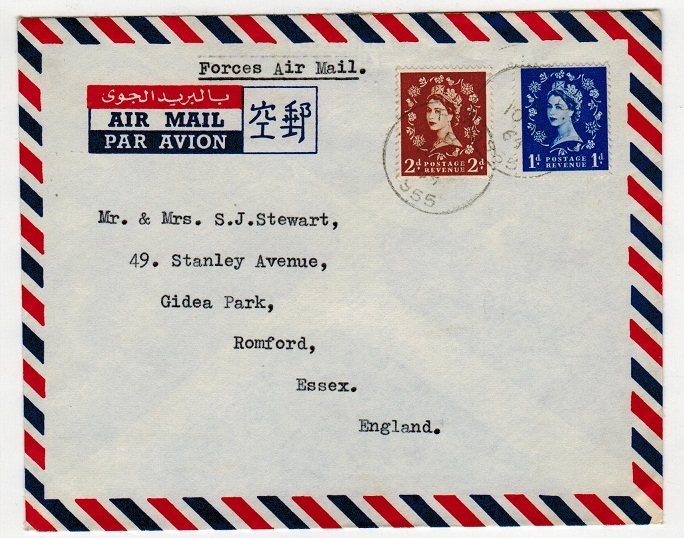 cover addressed to UK bearing 1a and 8a adhesives tied ADEN with red crested RAF/CENSOR/187 h/s at lower left. ADEN - 1912 1/4a grey PSC of India uprated to Germany and used at ADEN. H&G 19. 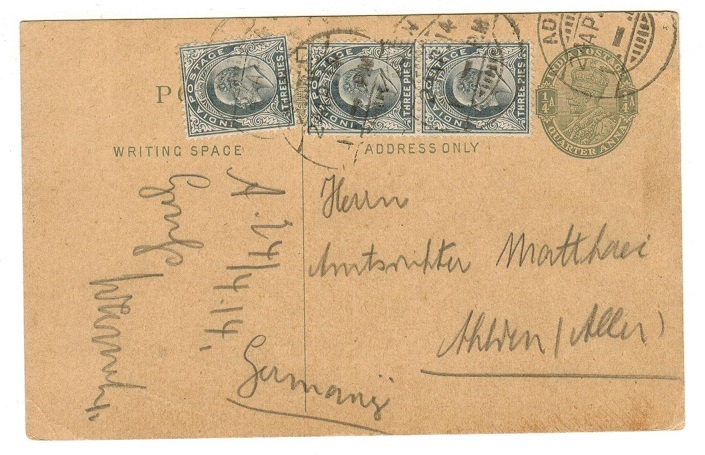 1912 1/4a grey on buff postal stationery postcard of India (H&G 19) addressed to Germany (no message) and bearing additional 3p grey (x3) adhesive strip tied ADEN and dated 24.AP.14. ADEN - 1937 cover to UK with 2 1/2a 'Coronation' issue used at KHORMAKSAR. 1937 (MAY.12.) 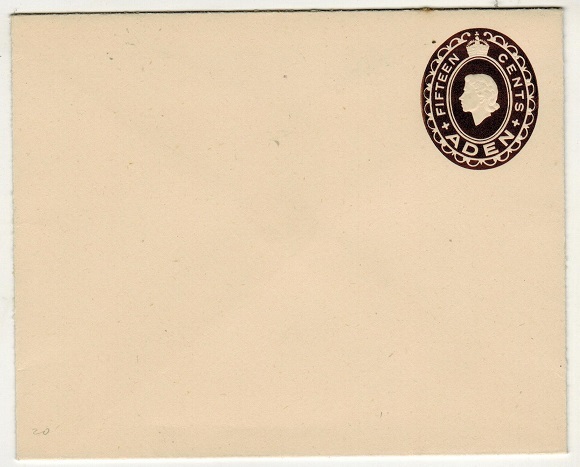 cover addressed to UK bearing 2 1/2a 'Coronation' adhesive used on the first day of issue and cancelled by KHORMAKSAR cds. 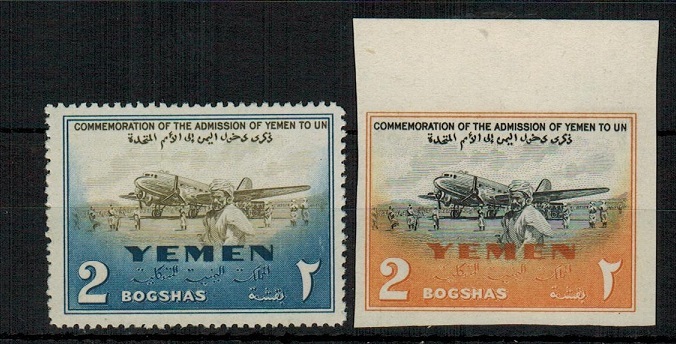 ADEN - 1952 15c on 1a brown PSE to Germany used at SHEIKH OTHMAN. H&G 14. 1952 15c on 1a brown on cream postal stationery envelope (size b) addressed to Germany (stamp missing ?) cancelled by SHEIKH OTHMAN cds. H&G 4. 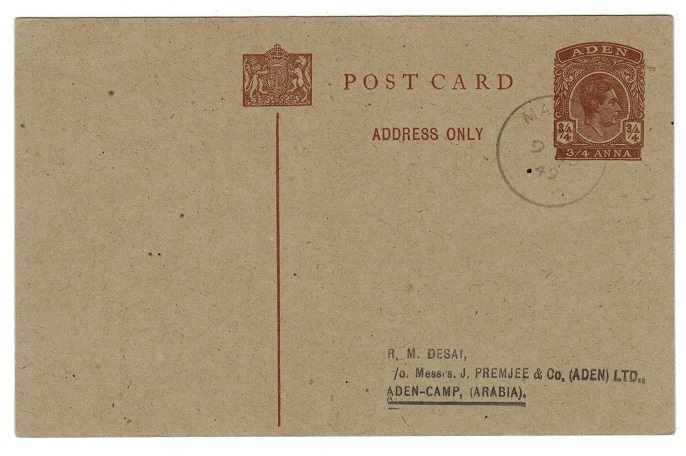 ADEN - 1939 3/4a red-brown PSC used locally (no message) at MAALLA. H&G 2. 1939 3/4a red-brown on dark buff granite postal stationery postcard addressed locally (no message) cancelled by MAALLA s/r cds dated 9.NO.49. H&G 2. ADEN - 1939 3/4a brown PSC unused. H&G 2. 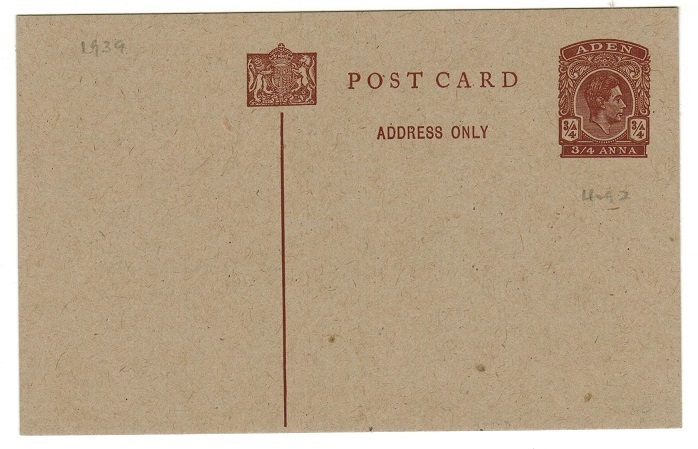 1939 3/4a brown on dark buff 'KGVI' postal stationery postcard in fine unused condition. H&G 2. ADEN (INDIA) - 1905 use of Aden postcard to UK. 1905 use of picture postcard addressed to UK depicting 'Aden, Steamer Point, Main Street'. The card was written in Aden for sure since the text concerns the living conditions in Aden and has dated annotation of August 12th 1905. 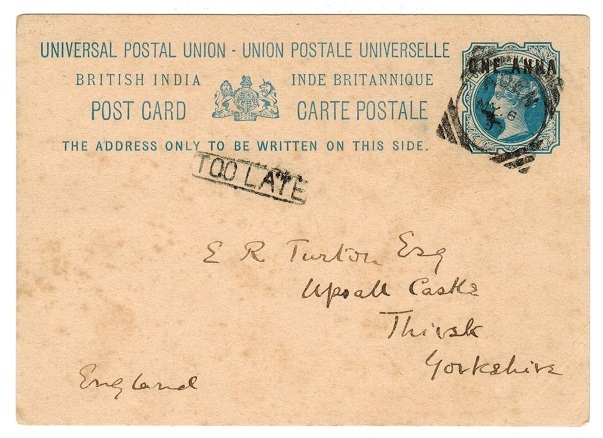 The card bears an Indian 1a adhesive and has been manuscriptly struck through with pen with a postal cancellation reading '…..BAD-KEW CANTONMENT' and is dated 17.AU.05 and with SEA POST OFFICE/C strike alongside dated two days later. 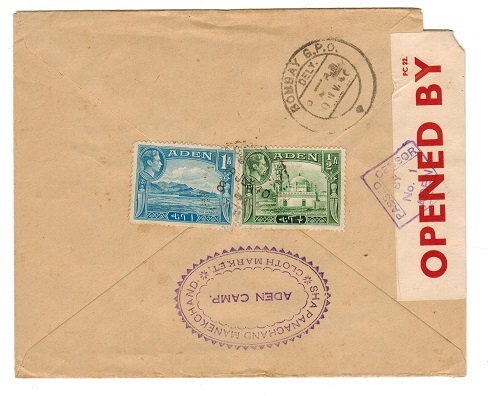 ADEN (States) - 1942 registered censor cover to UK used at SEIYUN. KATHIRI STATE - 1942 (JUL.1.) registered cover addressed to UK (Wells) bearing 8a, 1r and 2r adhesives tied by s/r SEIYUN cds's with blue R/No. registered label with MUKALLA added in red manuscript and PASSED CENSOR/BY/No.10/ADEN mark. A little grubby (ex reverse flap) but a scarce censor use of this Kathiri State mail. Early covers are scarce. ADEN (States) - 1942 multi franked registered censored cover from SEIYUN. KATHIRI STATE - 1942 (JUL.1.) 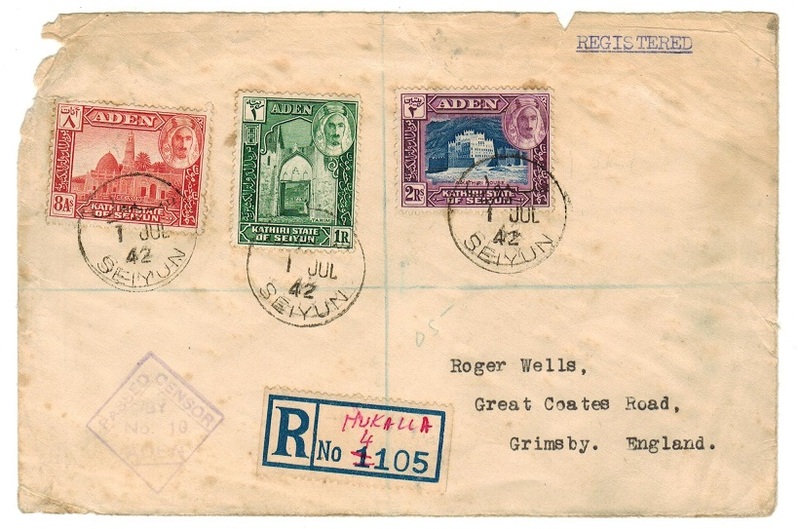 registered cover addressed to UK (Wells) bearing various adhesives to the 3a value tied by s/r SEIYUN cds's with red manuscript MUKALLA registered marking and struck by violet PASSED CENSOR/BY/No.10/ADEN mark. A little grubby but a scarce censor use of this Kathiri State mail. Early covers are scarce. ADEN - 1891 aged entire to India bearing Indian surcharge adhesives used in ADEN. 1891 (FE.17.) 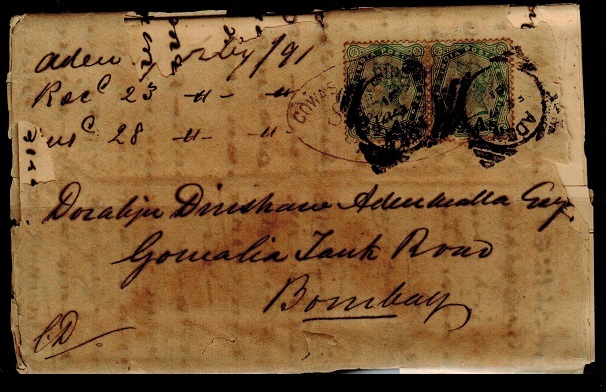 fragile cover (faults overall toned with age) addressed to India bearing Indian 2 1/2a on 4 1/2a yellow green adhesive pair (SG 102) tied by squared circle ADEN cancels. Scarce stamps used in Aden. SEA POST OFFICE transit b/s. Complete with original contents. ADEN - 1887 3a rate cover to India used at ADEN. 1887 (AU.16.) 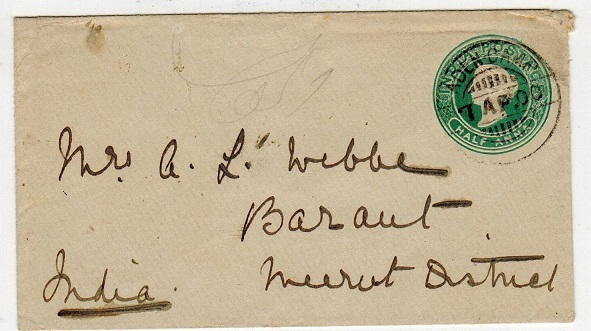 cover addressed to India bearing Indian 3a adhesive tied by squared circle ADEN cancel (Proud KD18). SEA POST OFFICE b/s. ADEN - 1883 1/2a green PSE to India used at ADEN CAMP. H&G 4. 1883 1/2a green on cream postal stationery envelope of India addressed to India and cancelled by ADEN CAMP cds dated 7.AP.00. BARAUT arrival b/s. H&G 4. ADEN - 1951 ADEN/SIGNALS cover from Aden Camp. 1951 (27.1.) small sized O.H.M.S. 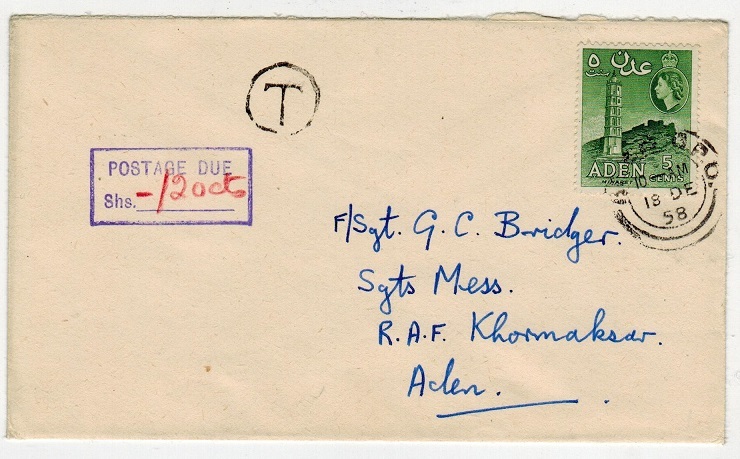 stampless cover addressed to HQ-BTA cancelled by fine ARMY SIGNALS/ADEN cancel with violet boxed CHIEF SIGNAL OFFICER/CERTIFIED OFFICIAL/ADEN CAMP handstamp at left. 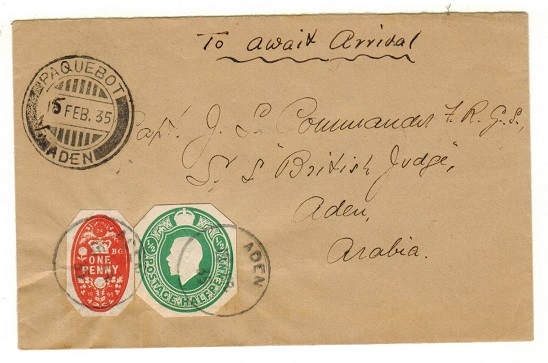 ADEN - 1915 PAQUEBOT/ADEN cover with 'GB' 1d pair use to India. 1915 (JL.2.) cover addressed to India with 'P&O' monogram on reverse flap bearing 'GB' 1d pair tied by PAQUEBOT/ADEN cds with bars at bottom. ADEN - 1959 ADEN/POSTAGE PAID/01.00 red TRIAL METER MARKING cover. 1959 (8.XII.) 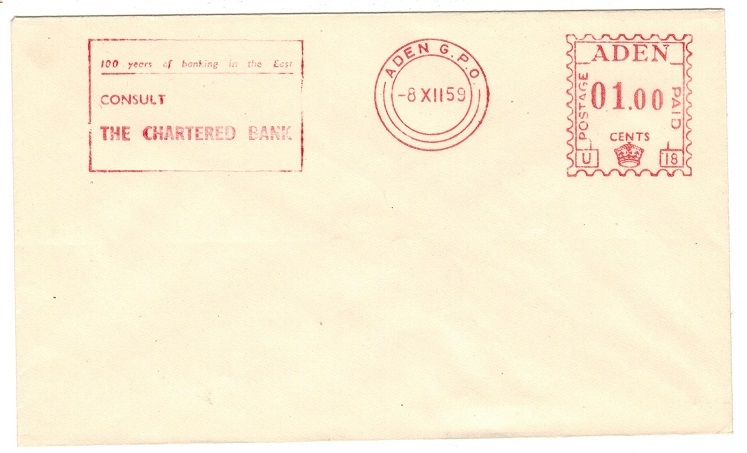 'Consult/The Chartered Bank' ADEN/POSTAGE PAID/01.00 red TRIAL METER MARKING unused cover. ADEN - 1937 3a RPSE unused. H&G 1. 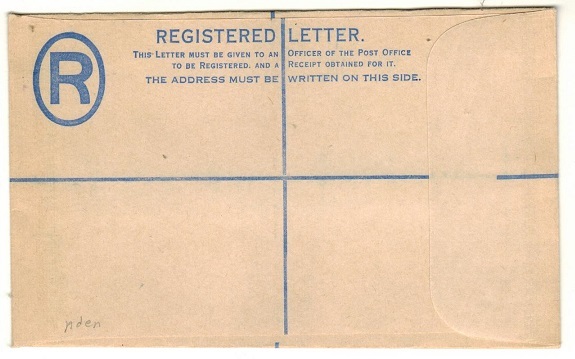 1937 3a Dark blue on cream registered postal stationery envelope (size G) in fine unused condition showing the 'THOS DE LA RUE & CO.' under flap of the scarce first printing with the addition of the STAMPS TO/PAY/POSTAGE/TO BE AFFIXED/HERE square instruction at the top right hand corner. This printing was in use for only two years. H&G 1. ADEN - 1943 RAF censor use of airgraph to UK. 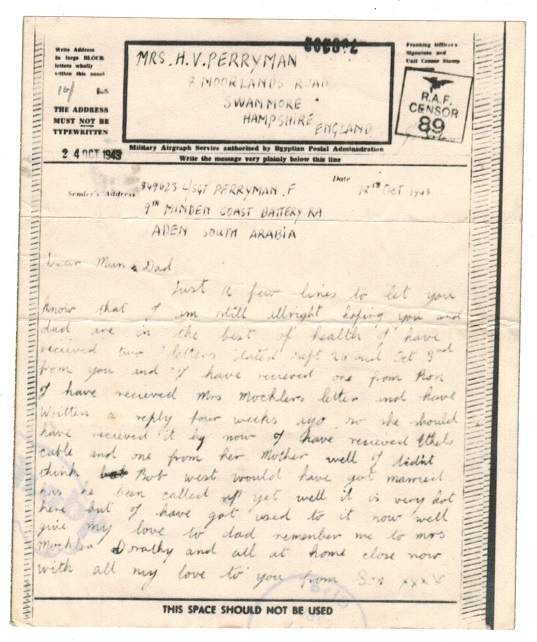 1943 (OCT.18) Airgraph addressed to UK from the 9th Minden Coast Battery in Aden cancelled by boxed RAF/CENSOR/89 h/s. 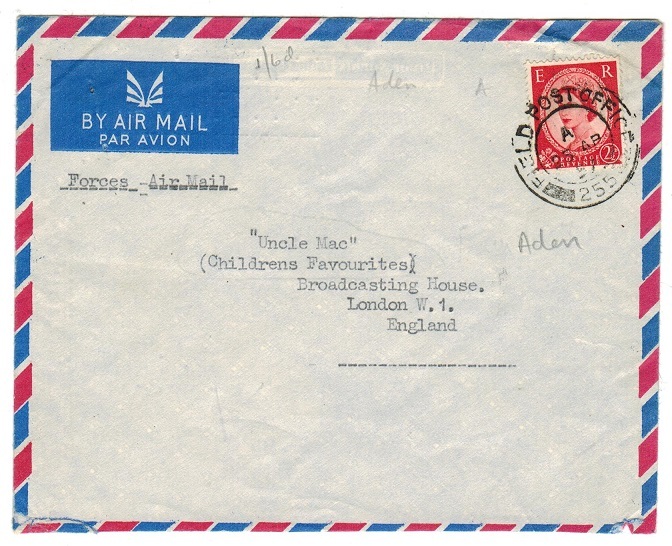 ADEN - 1952 50c on 6a stationery air letter to UK used at ADEN CAMP. H&G 4. 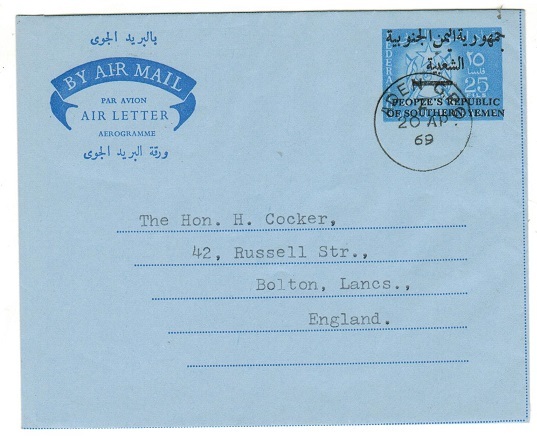 1952 50c on 6a dark blue air letter addressed to UK with 22.5mm surcharge variation (genuine use) and cancelled by ADEN CAMP cds dated 8.2.53. H&G 4. ADEN - 1942 naval censored cover to UK. 1942 (FEB.5.) cover addressed to UK bearing 2 1/2 a adhesive tied by ADEN cds with greenish boxed PASSED BY/NAVAL CENSOR crowned censor mark at lower left. ADEN - 1953 'GB' 6d airletter used at PAQUEBOT/ADEN on RMS Cilicia. 1953 (NO.23.) use of 'GB' 6d red on blue air letter addressed to UK and cancelled by PAQUEBOT/ ADEN GPO cds (Proud type SL9). A nice genuine use from R.M.S. Cilicia. ADEN - 1959 FPO/255 forces cover to UK used at KHORMAKSAR. 1957 (AP.25) cover addressed to UK bearing GB 'QEII' 2 1/2d adhesive tied by FIELD POST OFFICE/255 cds from RAF Khormaksar. ADEN - 1959 ADEN POSTAGE 00.10 red meter TRIAL cover. 1959 (8.XII.) 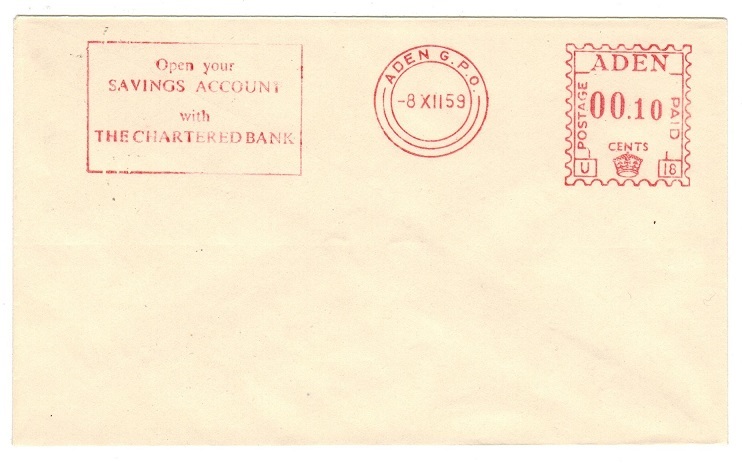 'Open Your/Savings Account/With/The Chartered Bank' ADEN/POSTAGE PAID/00.10 red TRIAL METER MARKING unused cover. ADEN - 1959 ADEN POSTAGE 00.15 red meter TRIAL cover. 1959 (8.XII.) 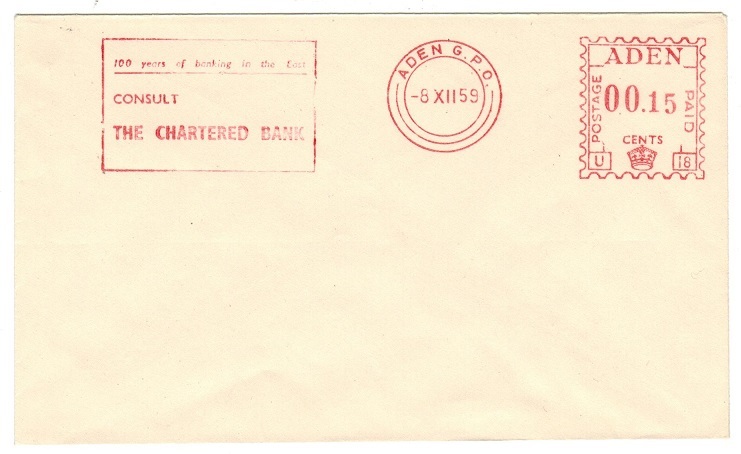 'Open Your/Savings Account/With/The Chartered Bank' ADEN/POSTAGE PAID/00.15 red TRIAL METER MARKING unused cover. 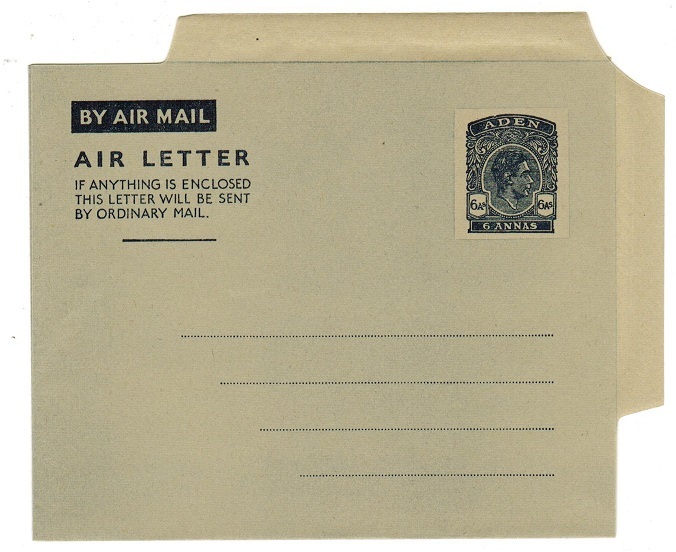 ADEN - 1949 6a postal stationery air letter unused. H&G 1. 1949 6a dark blue on grey paper postal stationery air letter in fine unused condition. H&G 1. ADEN - 1949 6a postal stationery air letter unused with FRAME BREAK VARIETY. H&G 1. 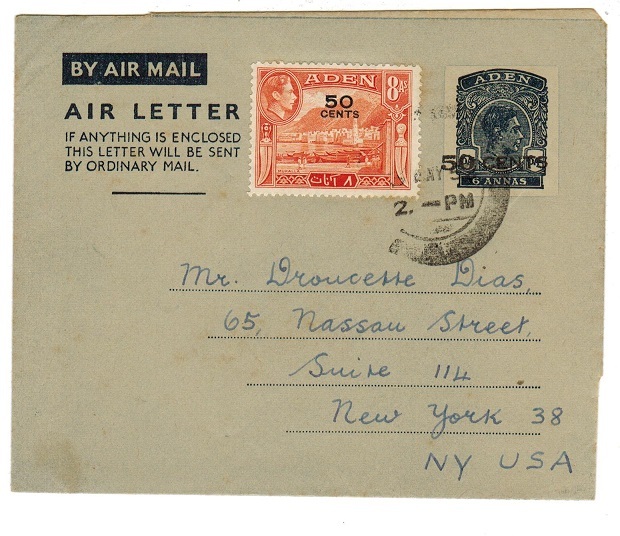 1949 6a dark blue on grey paper with bluish grey overlay postal stationery air letter in fine unused condition showing the BROKEN FRAME LINE BETWEEN A & D OF ADEN. (Kessler 1a). H&G 1. 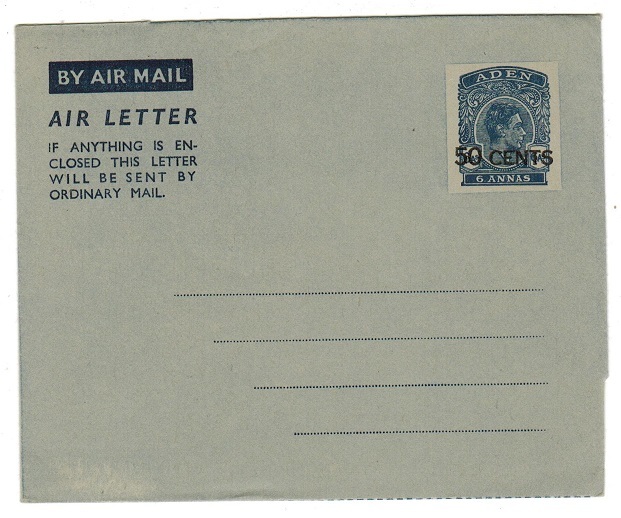 ADEN - 1952 50c on 6a postal stationery air letter unused. H&G 3. 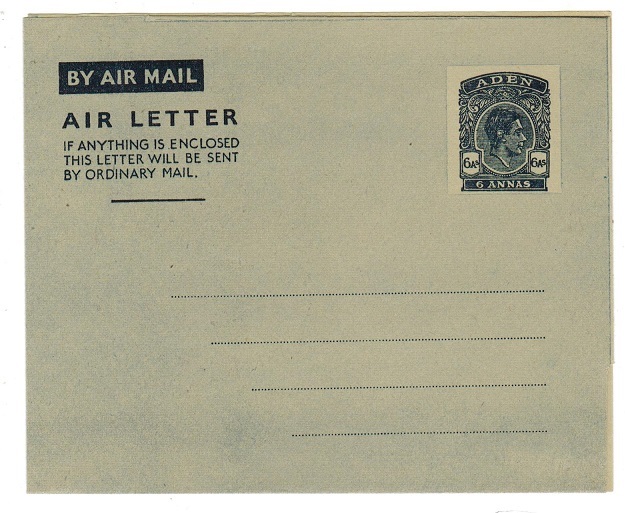 1952 50c on 6a dark blue on grey paper postal stationery air letter. 20 1/2mm issue. Fine unused. H&G 3. ADEN - 1936 1r rate registered cover to USA used at ADEN. 1936 (NOV.5.) 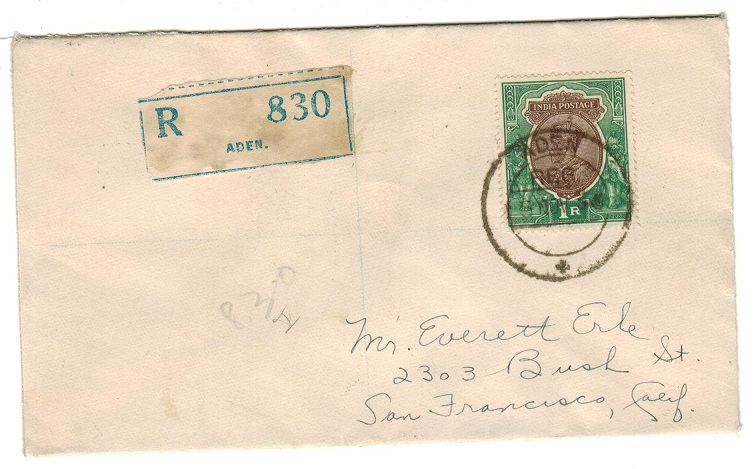 registered (Erle) cover addressed to USA bearing Indian 1r adhesive tied by ADEN/REG d/r cds. A scarcer high value adhesive use in Aden. 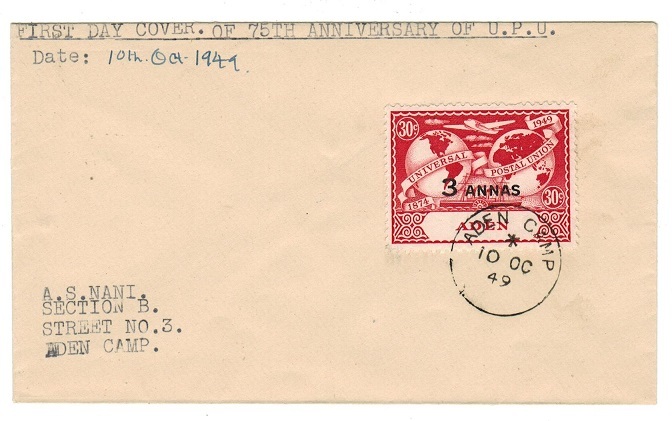 ADEN - 1949 3a/30c 'UPU' local first day cover from ADEN CAMP. 1949 (OC.10.) 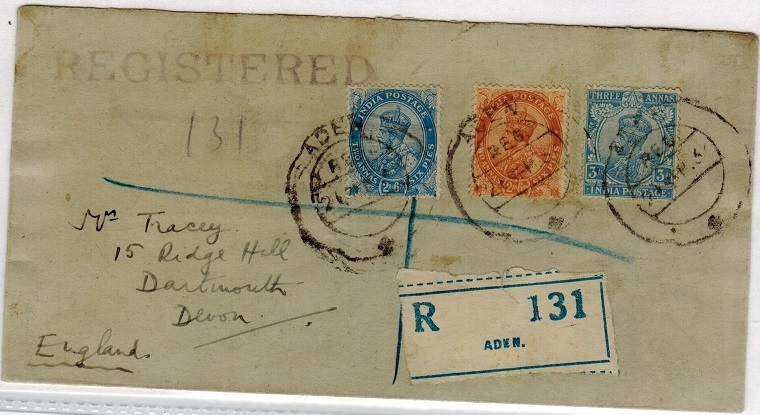 first day cover addressed locally bearing the Aden States 3a on 30c 'UPU' adhesive (SG 17) tied by ADEN CAMP cds. 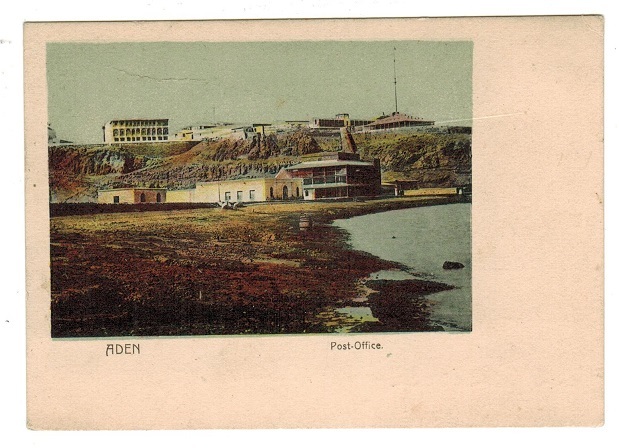 ADEN - 1900 (circa) postcard depicting POST OFFICE. 1900 circa coloured picture postcard depicting 'Post Office, Aden'. Handwritten on reverse but not sent. ADEN - 1958 underpaid local cover with POSTAGE DUE/SHS h/s applied. 1958 (DE.18) cover addressed locally bearing 5c (SG48) tied by ADEN GPO cds with black circled 'T' tax mark at left & superb violet boxed POSTAGE DUE/SHS.----- h/s. Proud type UP6. ADEN - 1964 forces cover from FPO/955 at RAF Khormaksar. 1964 cover to UK bearing GB 'QEII' 1d & 2d adhesives tied by F.P.O./955 cds from RAF Khormaksar. 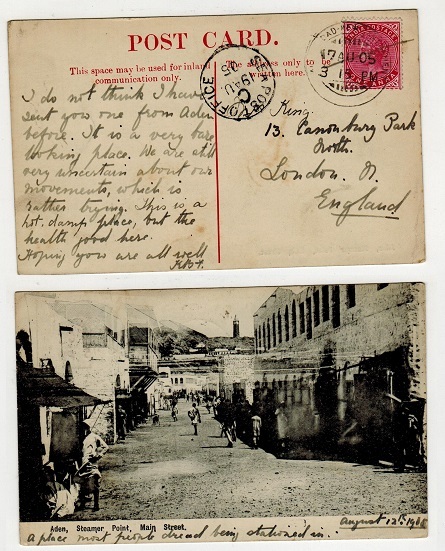 ADEN - 1906 postcard to UK with boxed PAQUEBOT strike. 1906 (FE.15.) use of picture postcard addressed to UK bearing GB 1d adhesive tied by boxed PAQUEBOT strike with ADEN cds at left. ADEN - 1904 postcard to Ireland with PAQUEBOT boxed strike. 1904 (DE.1.) 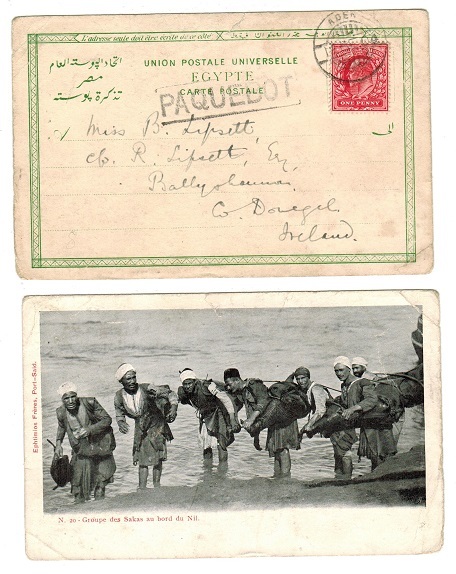 use of picture postcard addressed to Ireland depicting 'Groupe Des Sakas Au Bord Du Nile' bearing GB 1d adhesive tied ADEN with boxed PAQUEBOT strike at left. 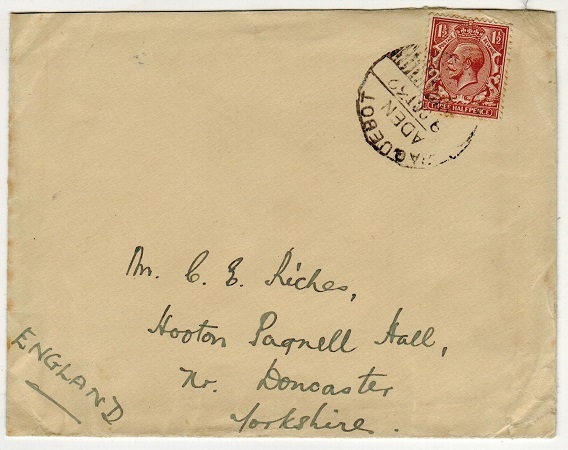 ADEN - 1916 FPO/324 censor cover to UK. 1916 (MY.26.) stampless cover addressed to UK (opened on three sides) marked 'On Field Service' and cancelled by F.P.O./No.324 cds on reverse side with magenta cog wheeled PASSED CENSOR/ ADEN/No. A-18 h/s on front. Indian troops stationed at Sheik Othman. 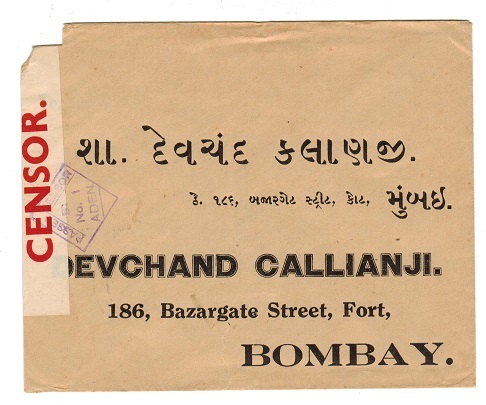 ADEN - 1943 censored cover to Bombay. 1943 (JUN.3.) 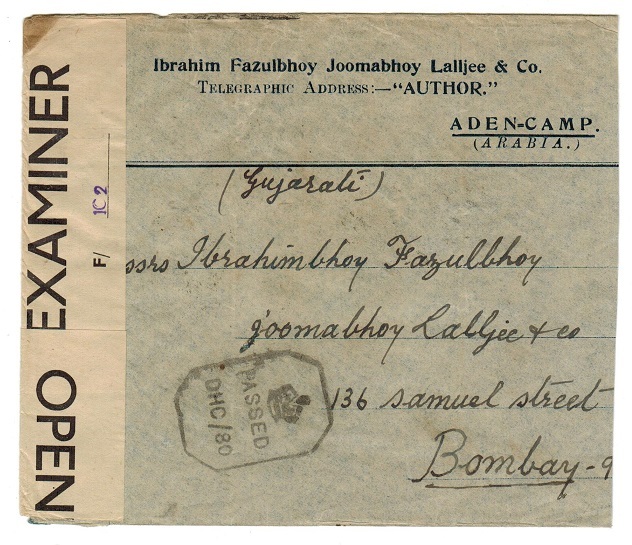 cover addressed to India bearing 1/2a and 1d on reverse flap (gum tone marks from flap) cancelled by smudged ADEN cds with black on white P.C.90/OPENED BY/EXAMINER/F/…. label at right with '1C2' h/s applied in violet. (Little type 6A). ADEN - 1892 ONE ANNA on 1/2a Indian PSC used at ADEN with TOO LATE h/s. H&G 9. 1892 ONE ANNA black on 1/2a blue on cream Indian postal stationery postcard (H&G 9) addressed to UK (light tone marks and short message on reverse) cancelled by squared circle ADEN cancel dated MY.6.97 with black boxed TOO LATE h/s at left. Marked on reverse 'latest reported use of this strike'. THIRSK arrival Ex Hart. 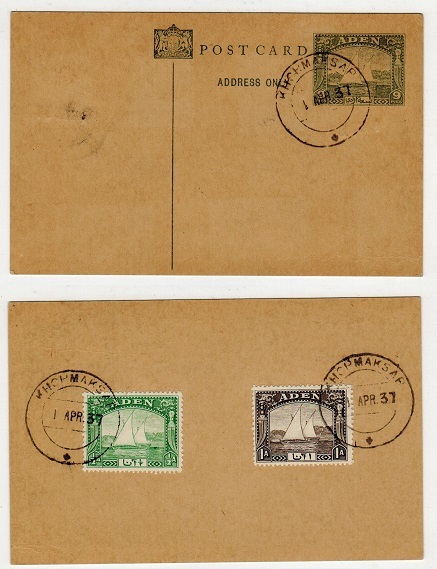 ADEN - 1952 50c on 6a air letter uprated to USA and with BROKEN FRAME ABOVE AD variety. H&G 4. 1952 50c black on 6a dark blue-grey on greyish postal stationery air letter with 22 1/2mm overprint addressed to USA (un-opened and with no internal message) bearing additional 50c on 8a orange and cancelled by ADEN cds dated 3.MY.52. The air letter shows the BROKEN FRAME LINE variety as catalogued by Kessler (4b). H&G 4. 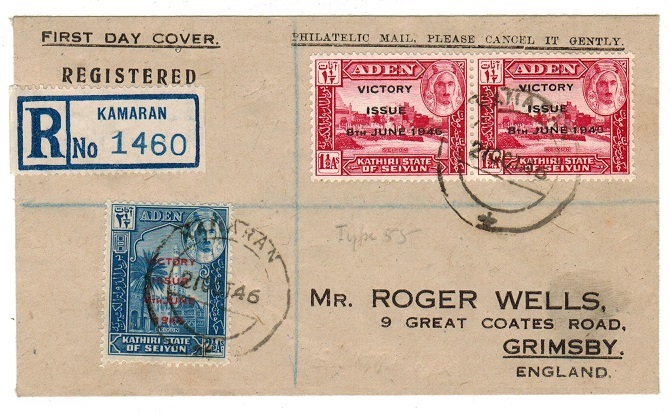 ADEN - 1940 PASSED BY CENSOR/No.1 cover to India. 1940 cover addressed to India bearing 1/2a and 2 1a adhesive on reverse side cancelled ADEN with red on cream P.C.22/OPENED BY CENSOR label at left tied on front by violet PASSED BY CENSOR/NO.1/ADEN h/s. ADEN - 1941 PASSED BY CENSOR/No.4 cover to Palestine. 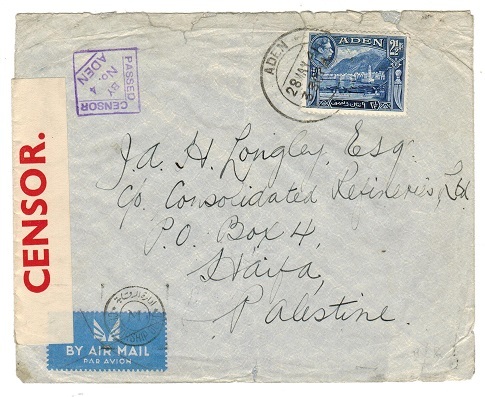 1941 cover addressed to Palestine bearing 2 1/2a adhesive cancelled ADEN with red on cream P.C.22/OPENED BY CENSOR label (raised stop) at left tied on front by violet PASSED BY CENSOR/NO.4/ADEN h/s.